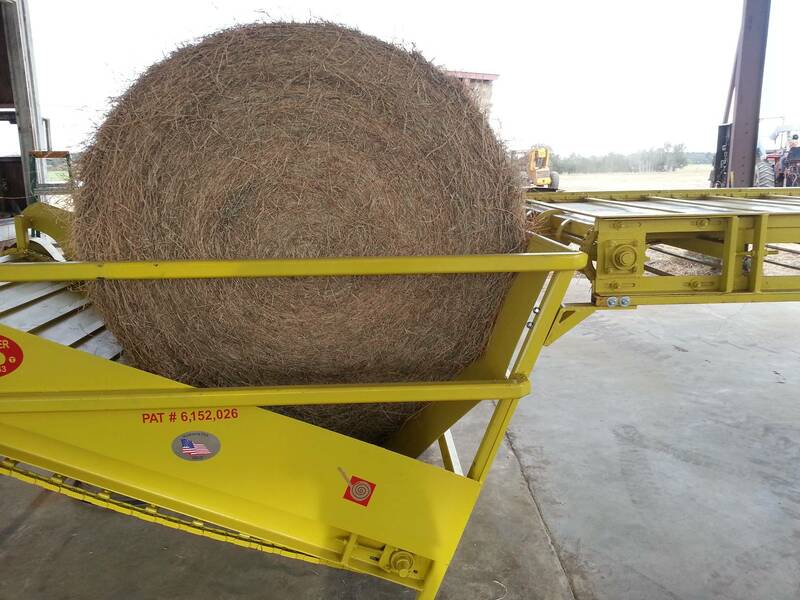 T's E-Z UNROLLER, manufactured by SIMPCO, INC. is just the ticket for converting round bales of wheat straw and coastal Bermuda hay into more convenient square bales. 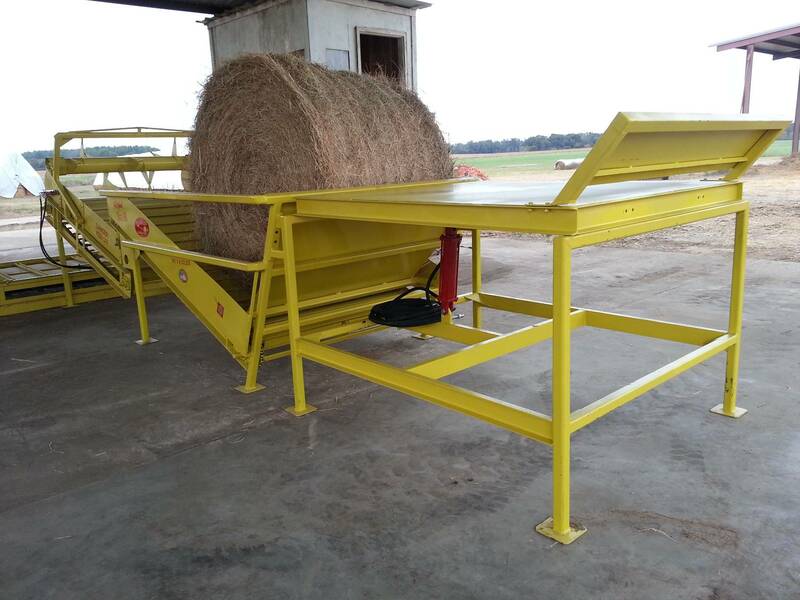 T's E-Z UNROLLER was designed and manufactured by a farmer to answer the consumer needs for smaller, easier to handle bales. T. WHIPPLE SIMPSON is a wheat straw and hay producer. 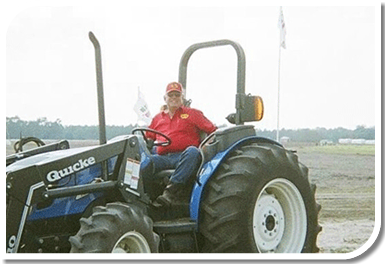 Born in 1933 and raised on a farm in Bleckley County near Cochran, Georgia. after attending the University of Georgia, he returned to work on the farm with his father where he raised his family of two sons and two daughters. 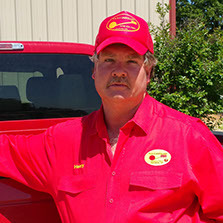 With the help of his youngest son Henry, they run and manage Simpco, Inc. and Simpson Farms. 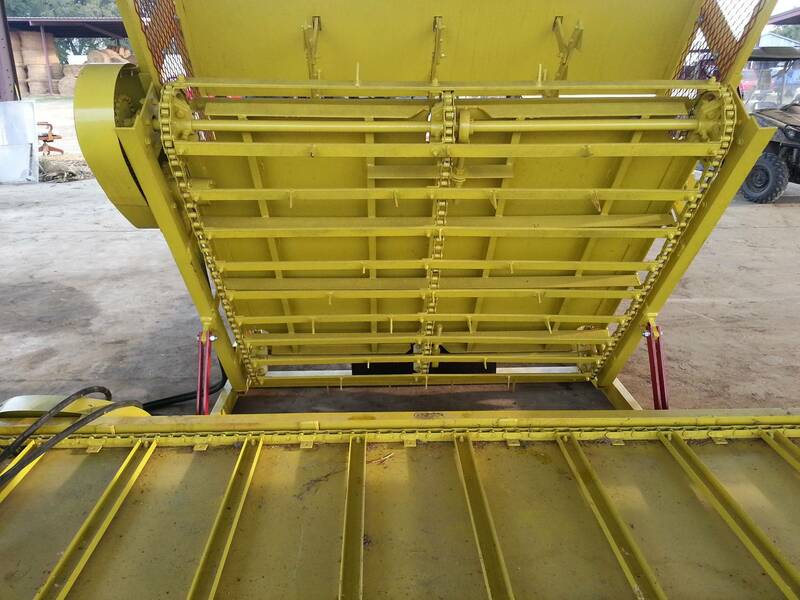 Being interested in mechanical things and what makes them work, Whipples inquisitive mind helped him to develop the T's EZ Unroller baling system. 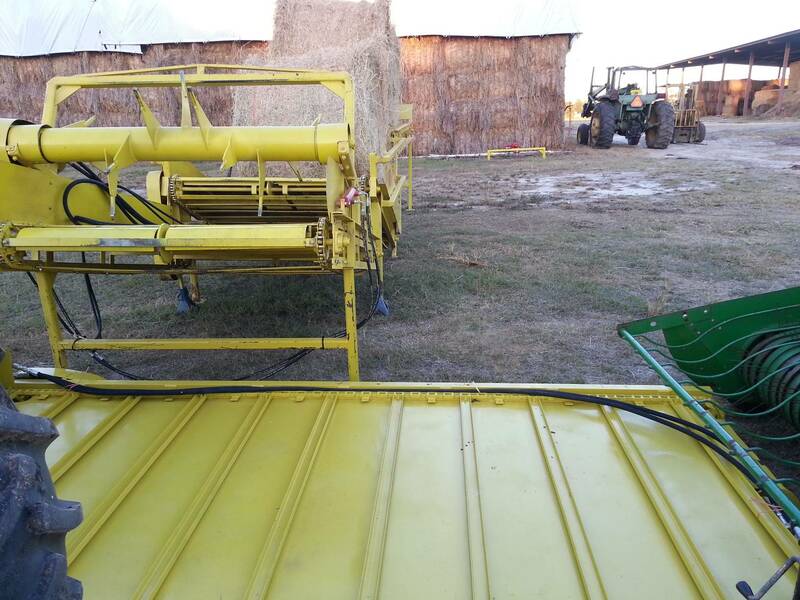 Works on any type of straw or hay. Under a shelter, the operation can run in any type of weather, 24 hours a day, 7 days a week. It saves time, labor, and cost. Rebaling does not change the character or quality of the product. The system is manufactured to high quality standards and is built to last. 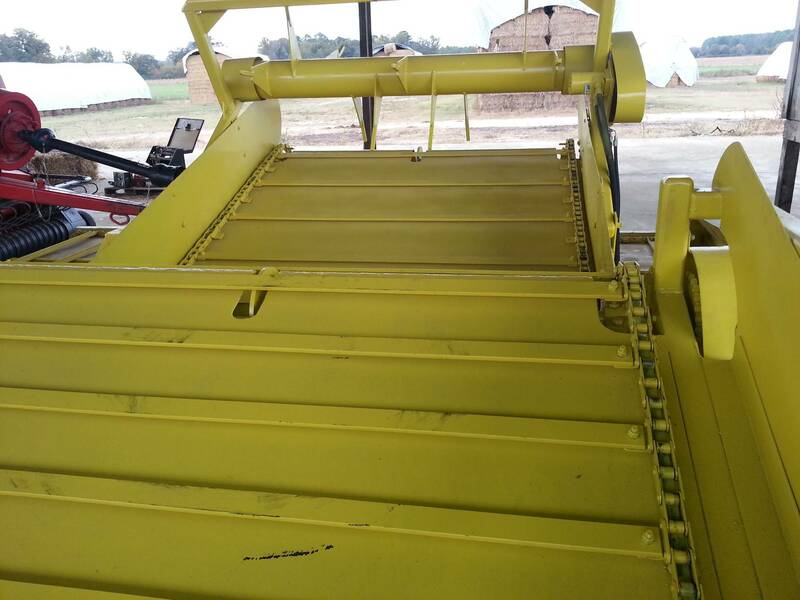 The T's E-Z UNROLLER has done for the hay industry what the cotton module has done for the cotton industry. With this system there is no down time. 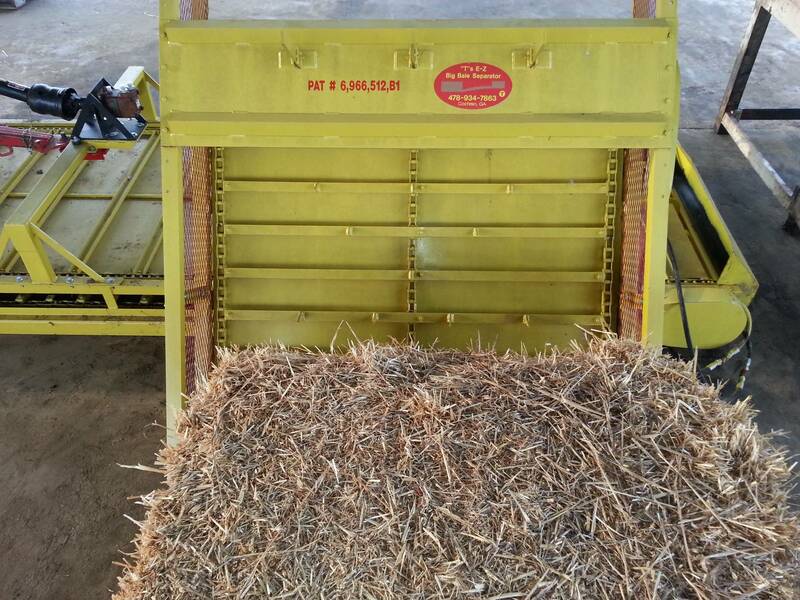 "L&N Farms...We could not supply our customers square hay without an unroller from Simpco"
We purchased our unroller from Simpco in 2007. It has totally changed our hay business. We put up 50000 square bales with 2 people. 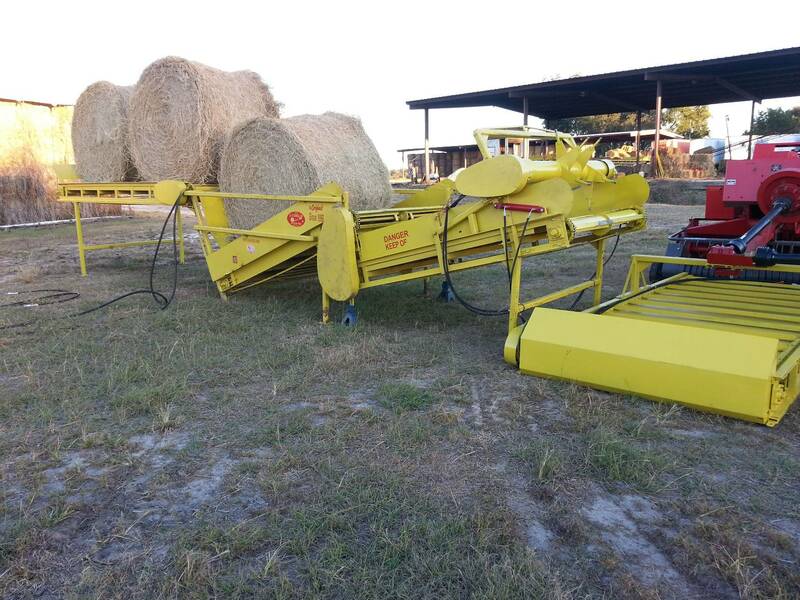 We could not supply our customers square hay without an unroller from Simpco. 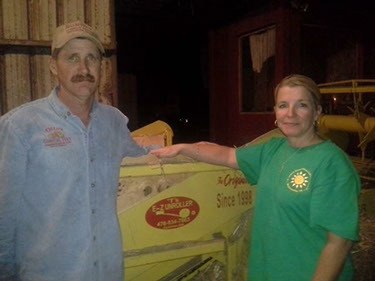 "JPJ Farms...Our hay operation was once a hobby"
"Our hay operation was once a hobby. It has now turned into a profitable source of income with the addition of the Simpson unroller. " 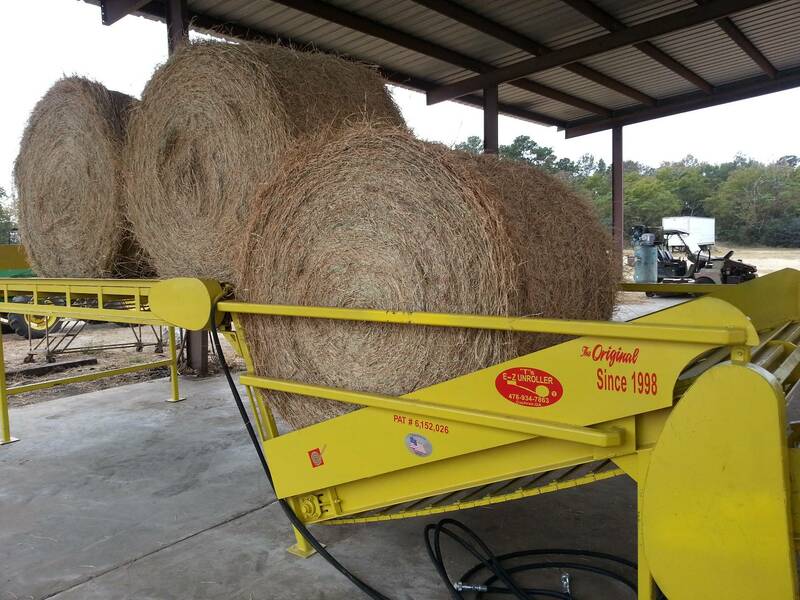 "Otto's Coastal Hay & Trucking...The unroller is great. " "The unroller is great. The Simpsons are a pleasure to do business with. They make sure the customer is comfortable with the equipment and they are available to answer all questions at all times"
"Georgia farmer invents 'fantastic' hay unroller..."
Cochran - T. Whipple Simpson went to a 1990 farm show in search of a machine that would unroll his 650-pound round bales of wheat straw so they could be separated into 40-pound rectangular bales. When he couldn't find one, he did the next best thing - he invented one. Simpson received a patent on his invention, the EZ Unroller, this month. 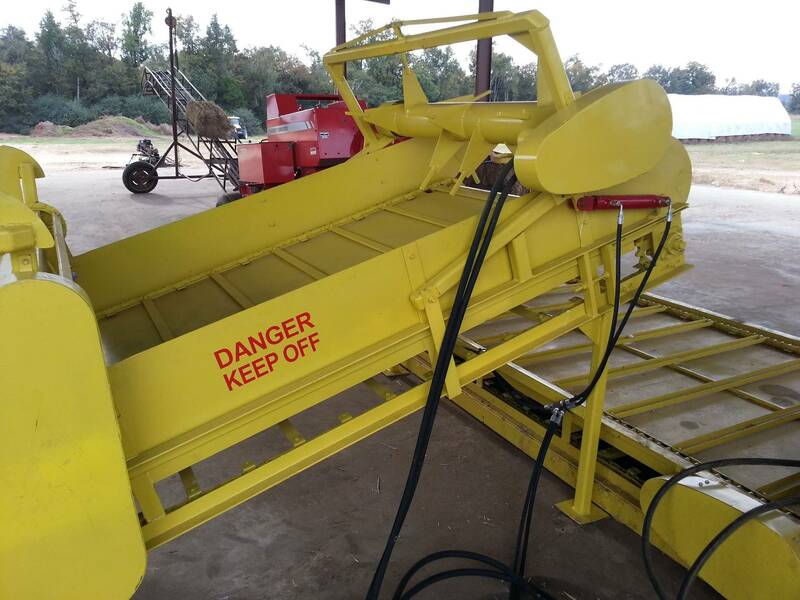 The middle Georgia farmer already has sold 17 of the machines- which start at $15,000- across the county and in Canada. 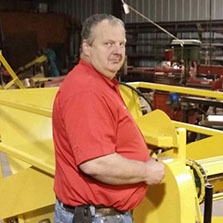 Al Cooper, a farmer near Waynesboro and one of Simpson's first customers, said he had been looking of a way to make the unrolling process faster and less labor-intensive. "I tried everything I could think of," he said. Then he saw a magazine article about Simpson's invention. I said, 'son of a gun, that darn machine will work.' 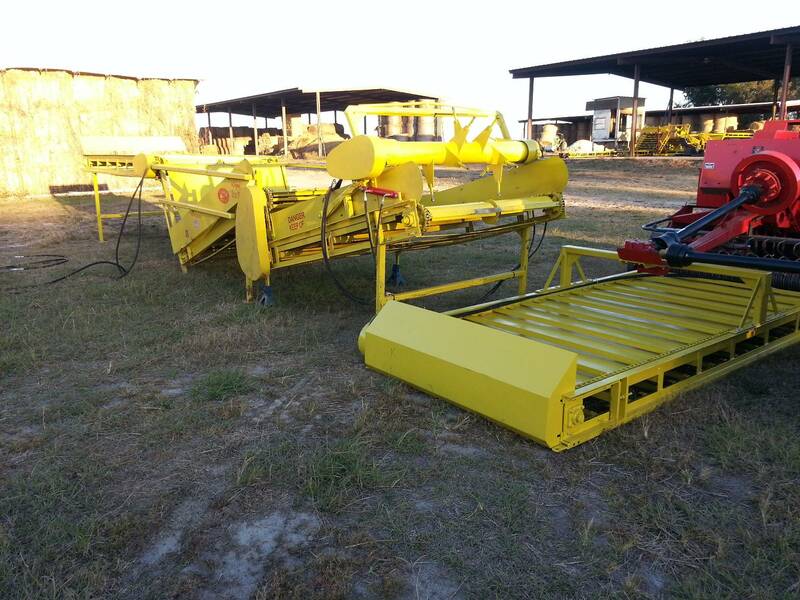 "
Simpson said the machine cuts a farmer's work time considerably. 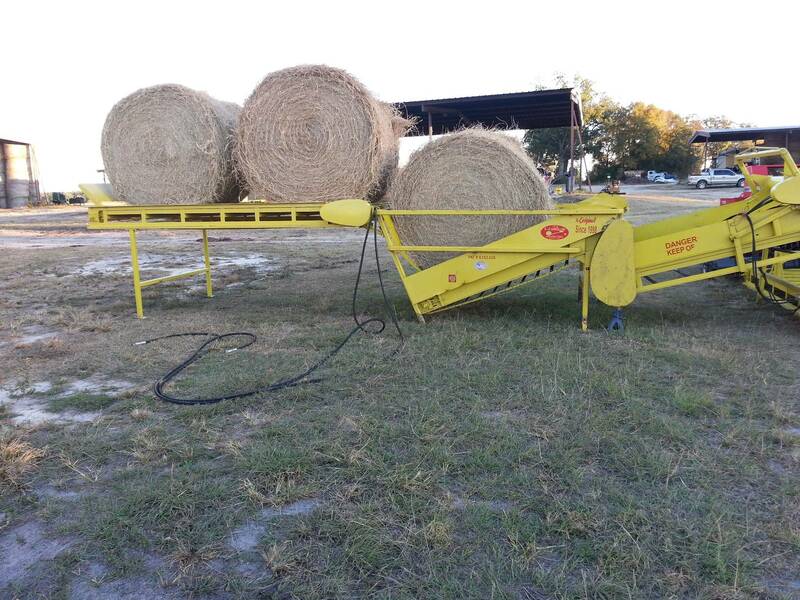 The quickest and most efficient way to bale hay and straw in the fields is to bale it into huge rounds, he said.
" A lot of wheat growers like to double-crop their fields, so they're in a hurry after they harvest the wheat to get the second crop in the ground. You've got only about 3 1/2 weeks to gather the straw before they come back to plant again." 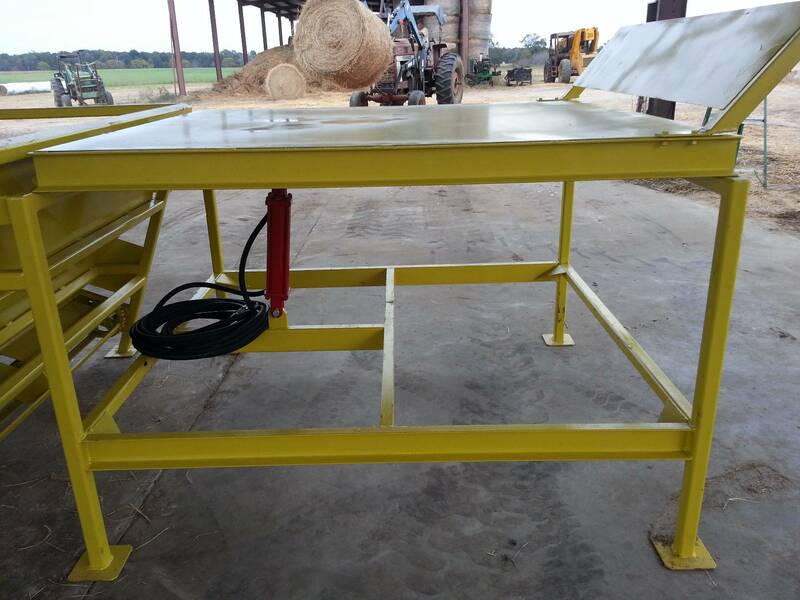 The unroller makes it easy for the producer to wait until a less hectic time to make the smaller bales most buyers want. "If it is rolled, we'll unroll it," Simpson said. 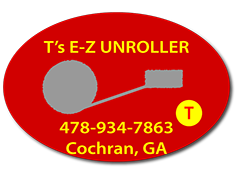 The E-Z Unroller comes in single and double models. 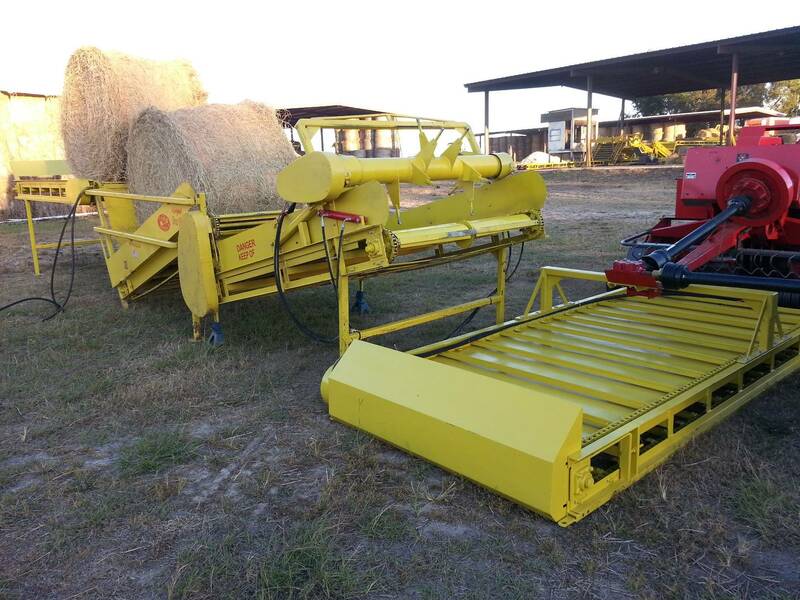 The single-sided machine, powered by a tractor, sells for about $15,000. 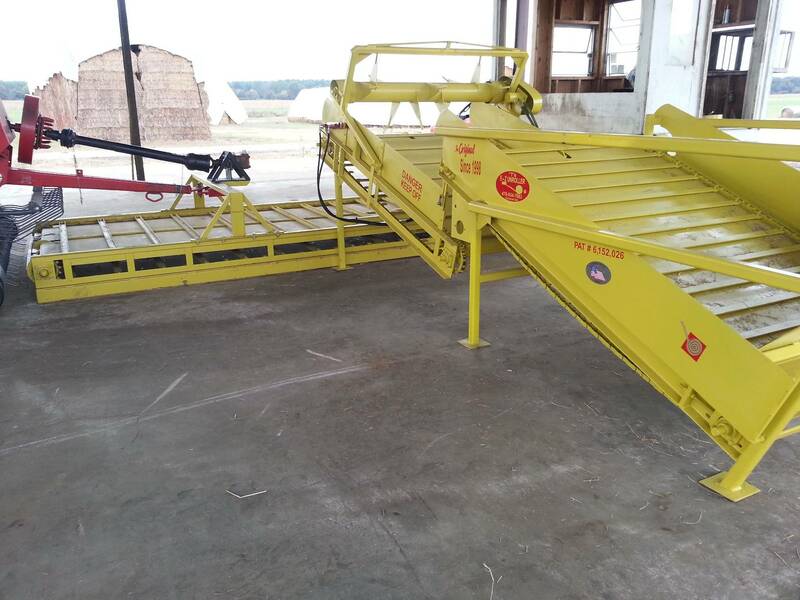 Cooper bought his double model that comes with four motors that drive the components and power hydraulic system for the conveyor belting, for $43,000. 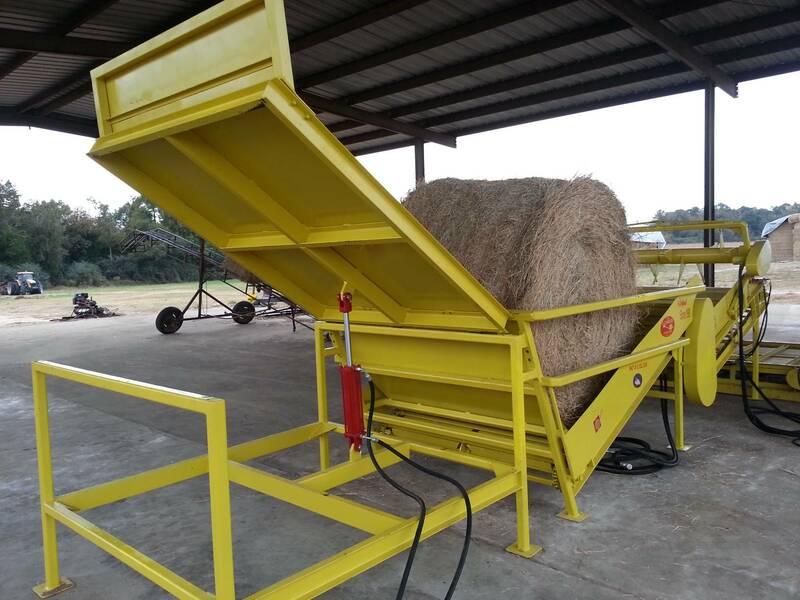 Cooper, who grows hay and straw and raises cattle, said he sells 160,000 to 200,000 rectangular bales of straw per year, mostly for land scraping use in metro Atlanta. Simpson's invention is "just fantastic," he said. 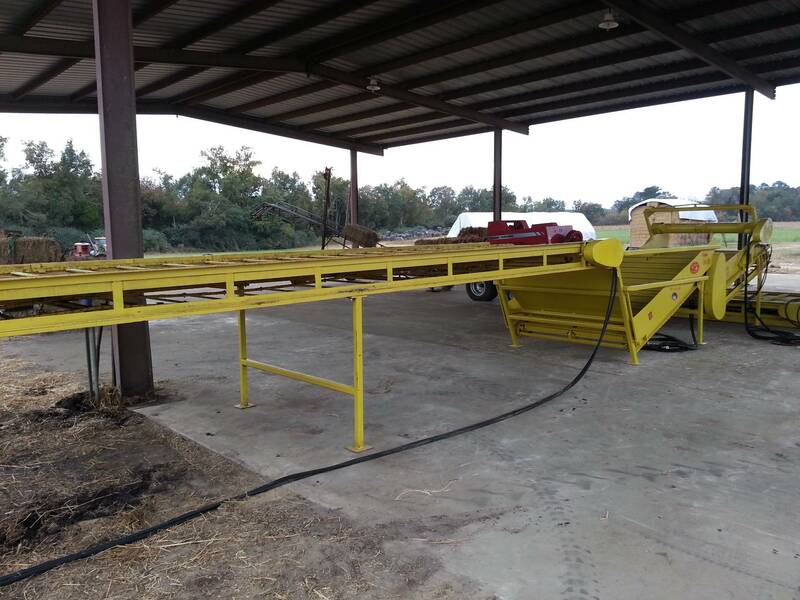 "He and I have both been in the straw business for years, and we're always looking for a better way to save money and to save labor," Cooper said. Simpson's son Henry works with him to operate the unroller on their farm near Cochran. Using five levers, one drives the machinery, see sawing a thresher back and forth to loosen the tightly packed straw from the round bale. 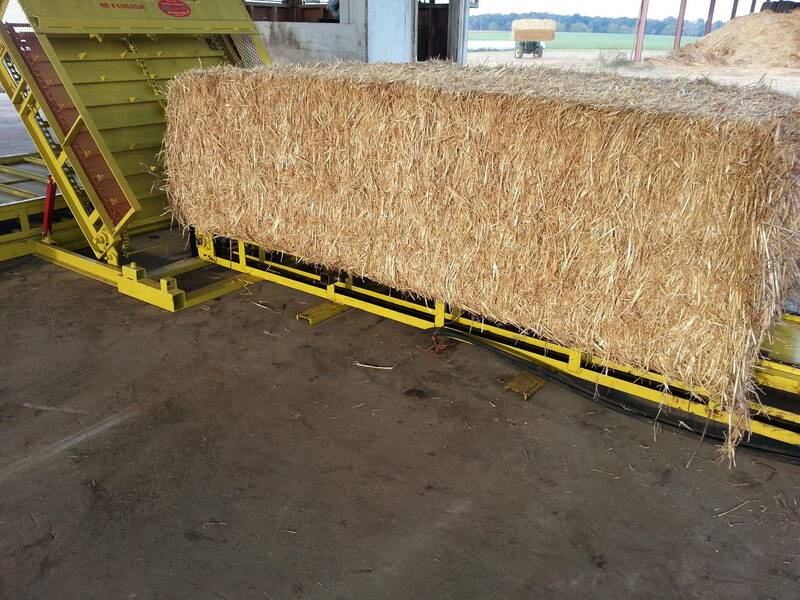 The entire process-from rolled bale to rectangular bale- takes four minutes, Simpson said. 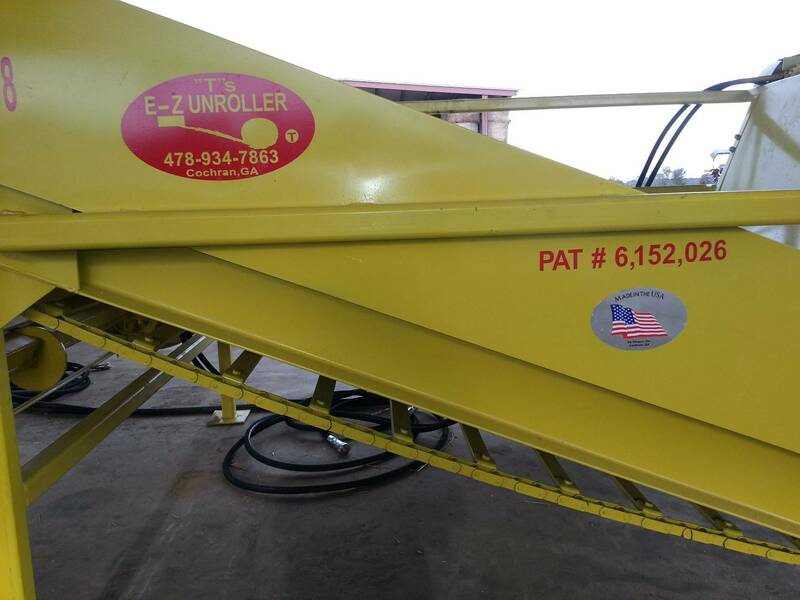 The EZ Unroller is painted bright yellow. Simpson said the color decision was fairly easy one. A local paint dealer had pink, yellow and black in gallon buckets. "I knew I didn't want black," Simpson said. "I thought I might use pink," but his wife objected." I can't repeat what she said about it," Simpson said with a grin. "So they're yellow. It works. It's nice and bright and eye-catching." "Unroller" Turns Big Round Bales Into Small Square Bales..."
“We raise 250 acres of hay each year and also do custom baling for others. We sell most of our own hay to horse owners who prefer small square bales. 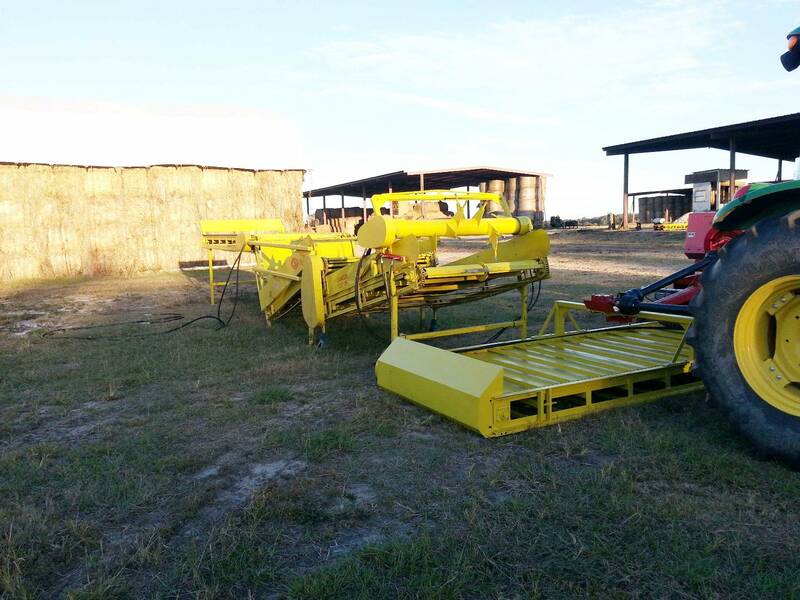 The problem is that we use round balers in the field because they’re so much faster and require less labor. 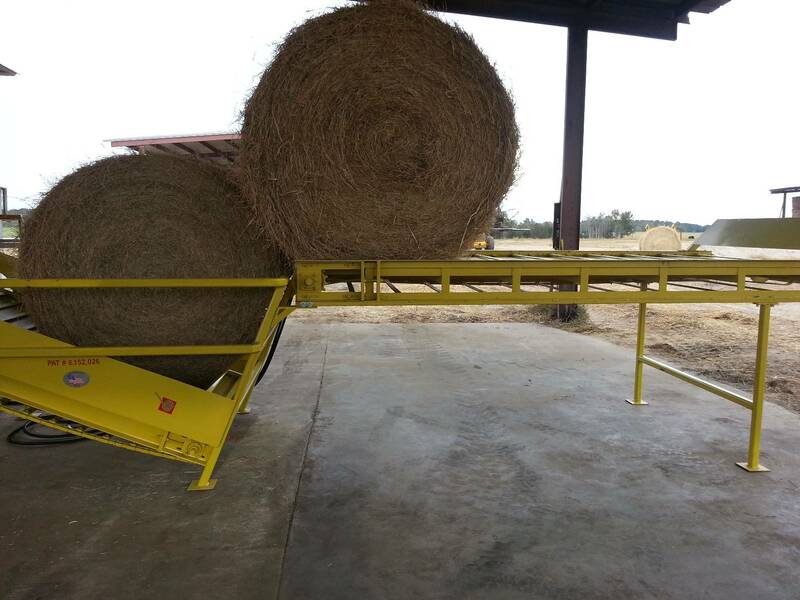 That’s why we came up with this unroller,” says T. Whipple Simpson and his son, Henry, Cochran, Ga.
Last year Simpson used his invention to unroll 7,000 big round bales, making a total of 140,000 small square bales with his stationary baler. 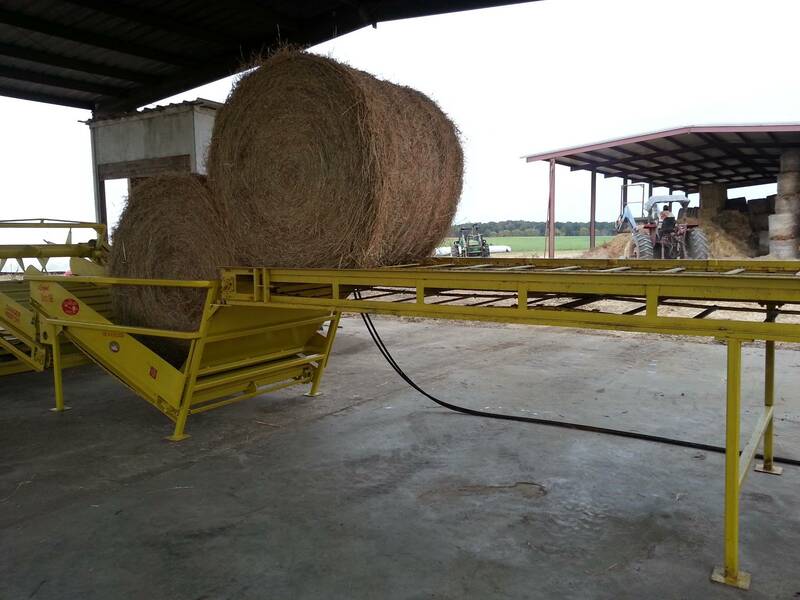 "It lets us make small bales when we have more time. It's the perfect solution for any hay producer who wants to bring in the crop fast but needs to supply his market for square bales," he notes. 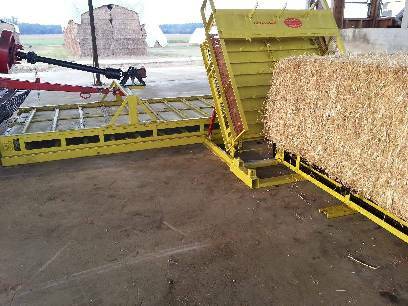 In addition to hay, Simpson also uses the unroller on straw bales. He says he generally only has a 3 to 4 week window to harvest straw bales. 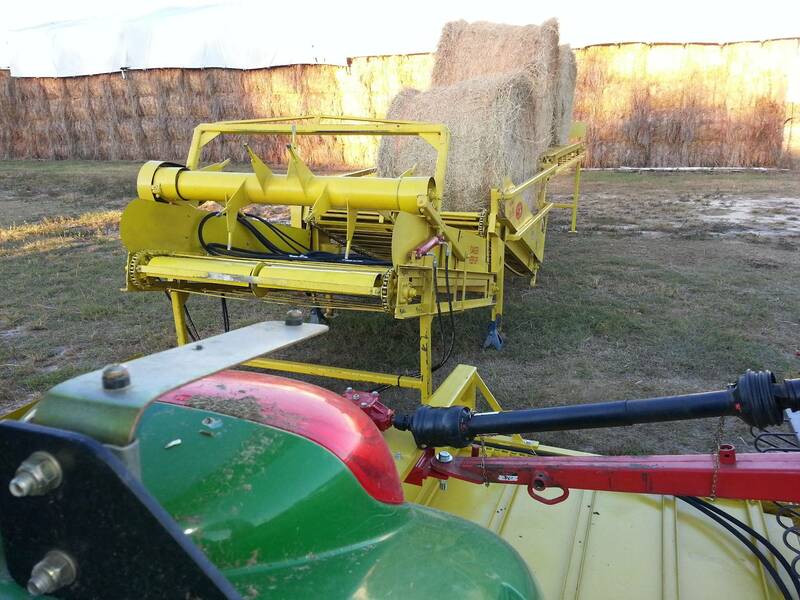 He says he generally has on a 3 to 4 week window to harvest straw so he brings it in as fast as he can and then converts the round bales into small bales later. 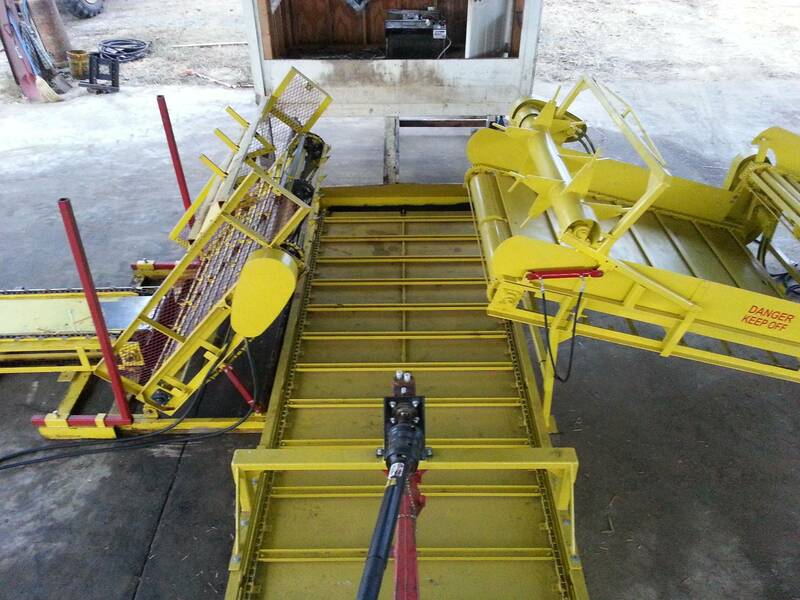 Simpson made his original unroller using all salvaged parts from discarded equipment. It took several years to get the design right. Power is provided by tractor hydraulics and the PTO. 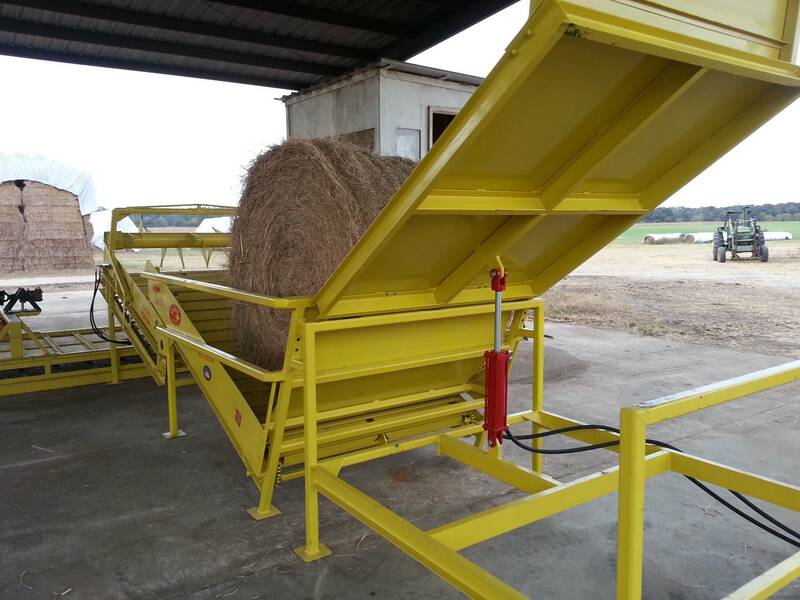 The unroller consists of the three conveyor units that unroll the bales and then fluff up the hay or straw before feeding it into the baler. "It takes only five or six minutes from the time we load on a round bale until we've got the square bales on the truck. The great things is that we can double the value of a big round bale by rebaling it. And we can do the work when we have time," notes Simpson. He has all components on his unroller are standard off-the-shelf parts. You can use any commercial square baler with the unroller. 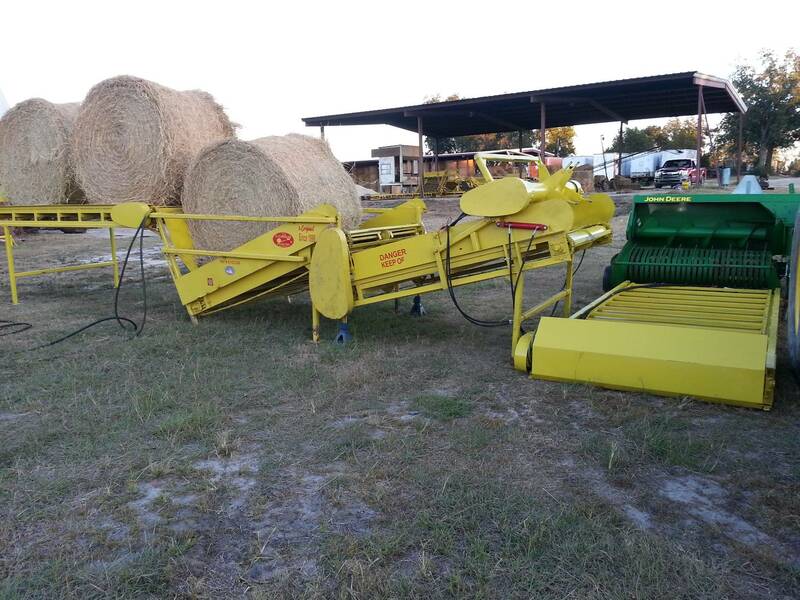 You can use any commercial square baler with the unroller. It generally takes 3 people to run the unroller at full capacity. One person with a front-end loader bales onto the machine and cuts the twine off. 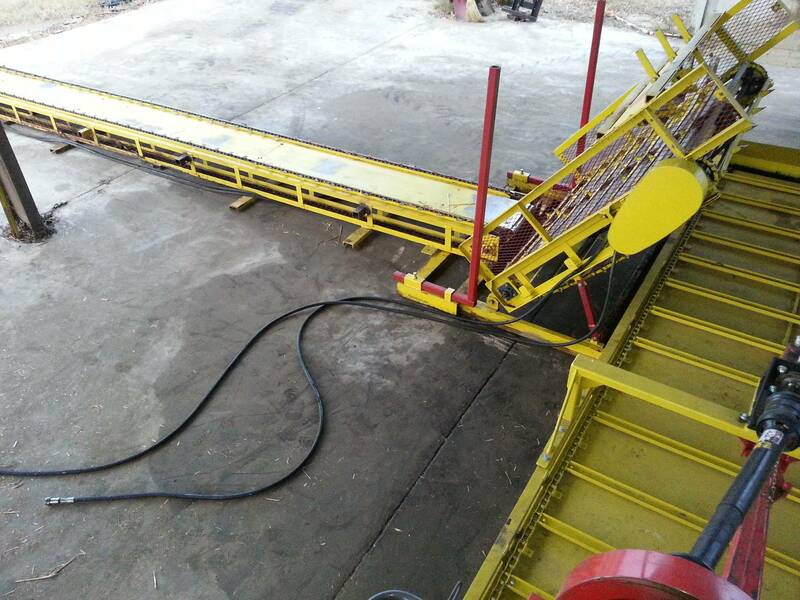 A second person runs the hydraulic levers that control the unrolling operation. All functions are reversible or can be stopped instantly. 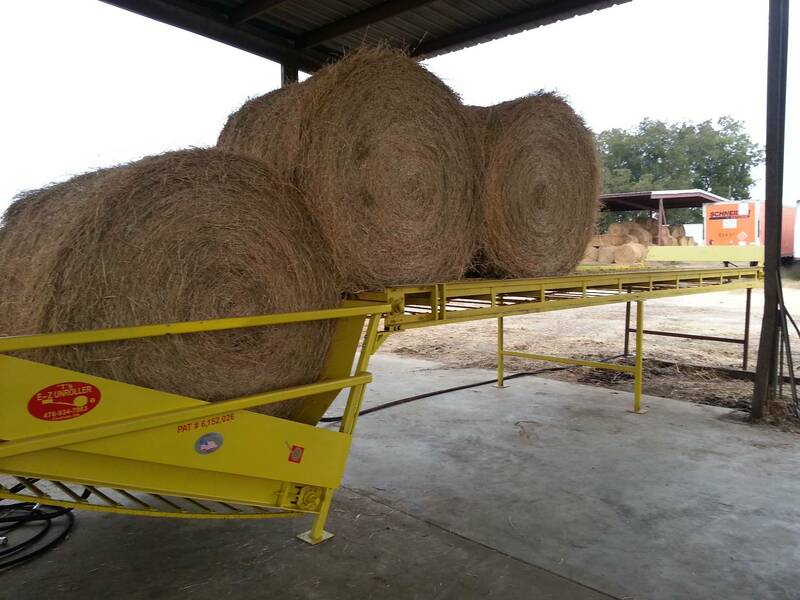 The third person does all the stacking of square bales onto trucks or trailers. 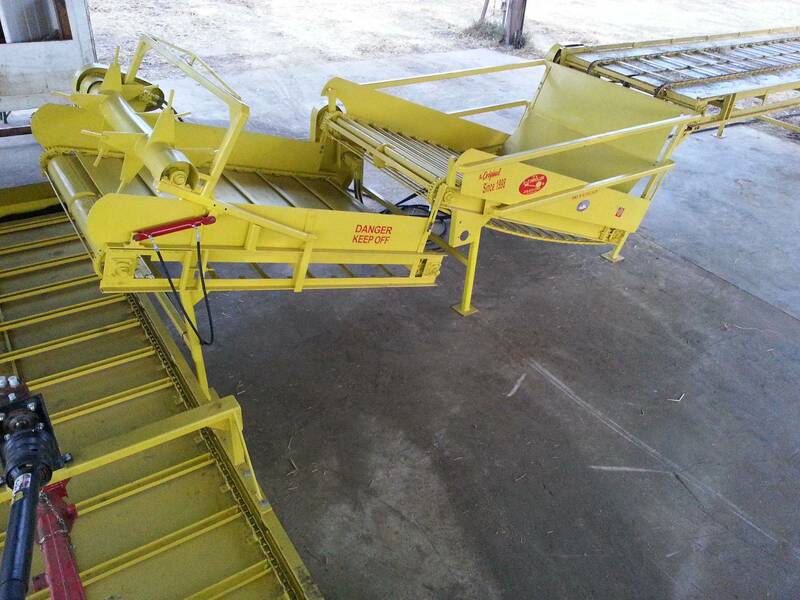 Simpson built a conveyor to make this easy. 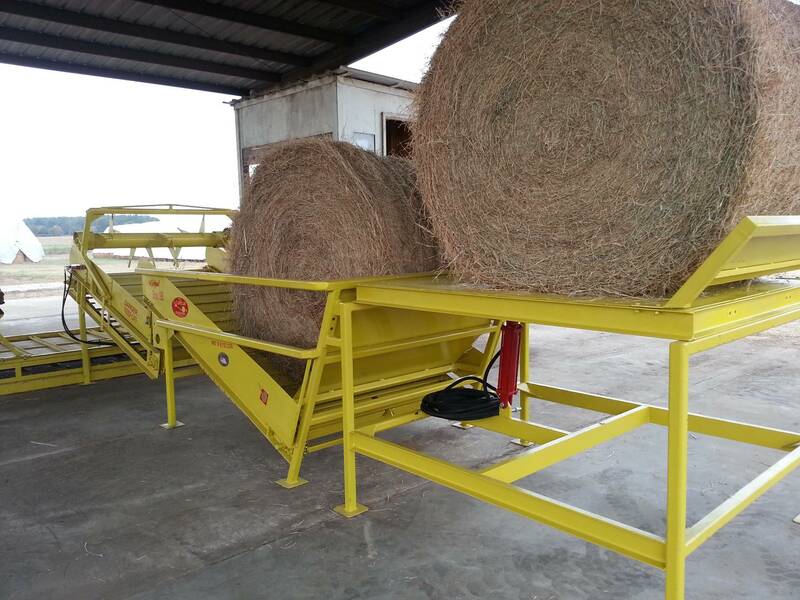 It rolls back and forth on a telescopic extension so the bales so the bales simply fall off the conveyor at the feet of the operator on the truck or trailer. 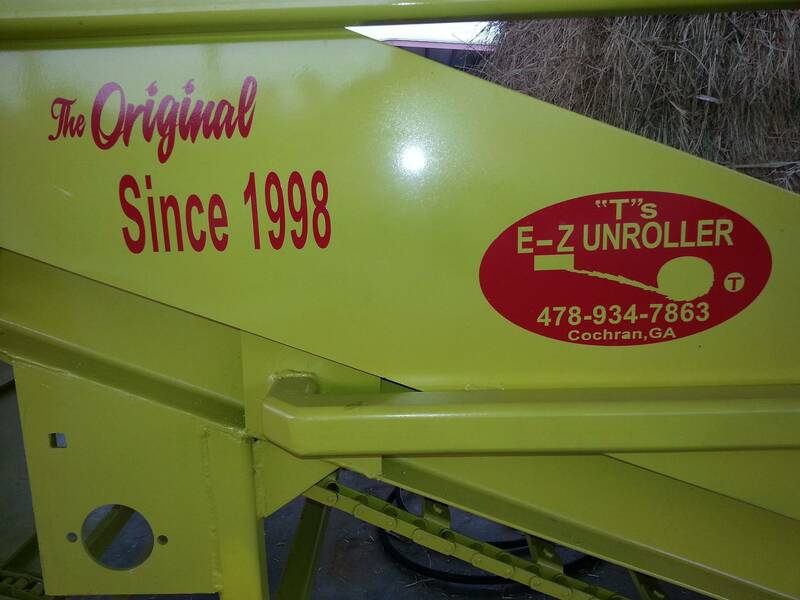 Simpson showed off the EZ Unroller for the first time at the Sunbelt Show in Georgia this fall. He has already sold six units by word of mouth. 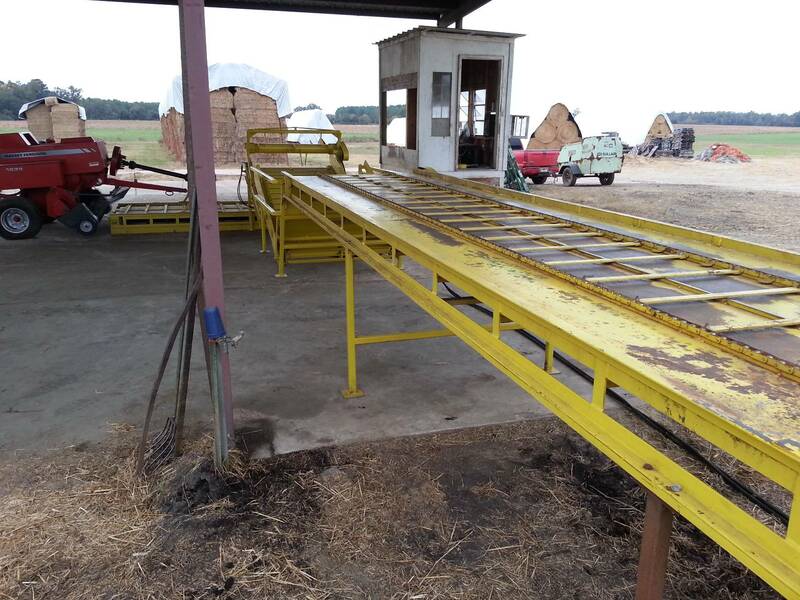 A single unrolling unit, which is powered by tractor hydraulics, sells for $17,000. A double unit, with it's own 50-hp. 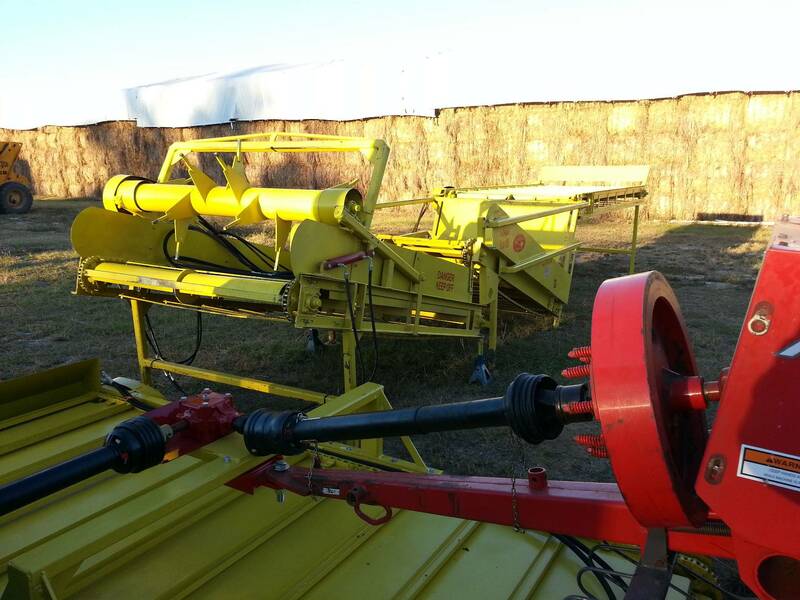 Engine and self-contained hydraulics, sells for $40,000. Contact: Farm Show: Followup, T. Whipple Simpson, Simpson Farms, Rt. 2, Box 247-7, Cochran, Ga. 31014 (ph. (478)934-7863). "Bale in the Winter - Bale in the Rain..."
Under a shelter, this homemade rig unrolls round bales to convert them to square bales. 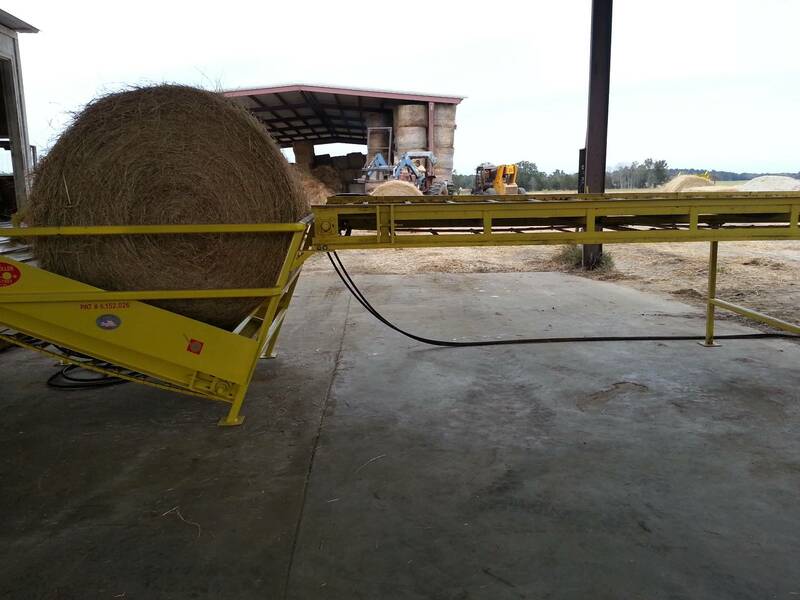 On a late winter day, with rain falling outside, Whipple Simpson was busy under his shelter barn baling bermudagrass hay. Actually he was rebaling the Coastal by taking hay from large round bales made the previous summer and converting it into small rectangular bales his horse customers prefer. 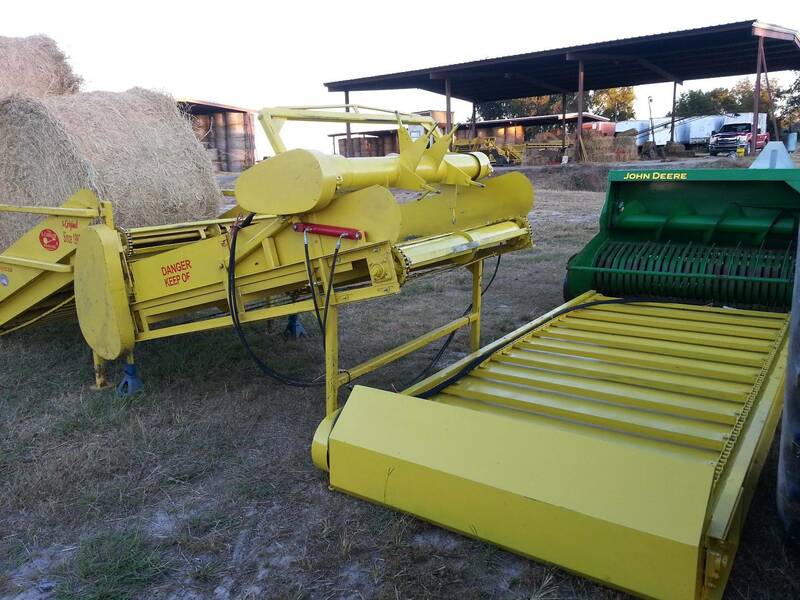 Simpson, from Cochran, Ga., was able to rebale the hay that day by using his own invention. 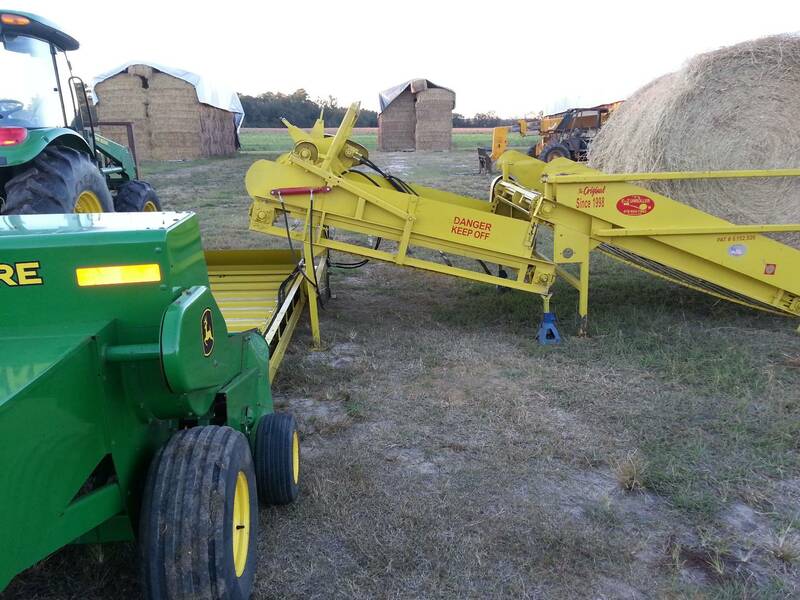 It took five years and many hours of cutting and welding, but with help from outsiders on hydraulics he came up with a machine that unrolls round bales and feeds the unwrapped forage into a nearby square baler. "We are committed to unrolling," says Simpson. 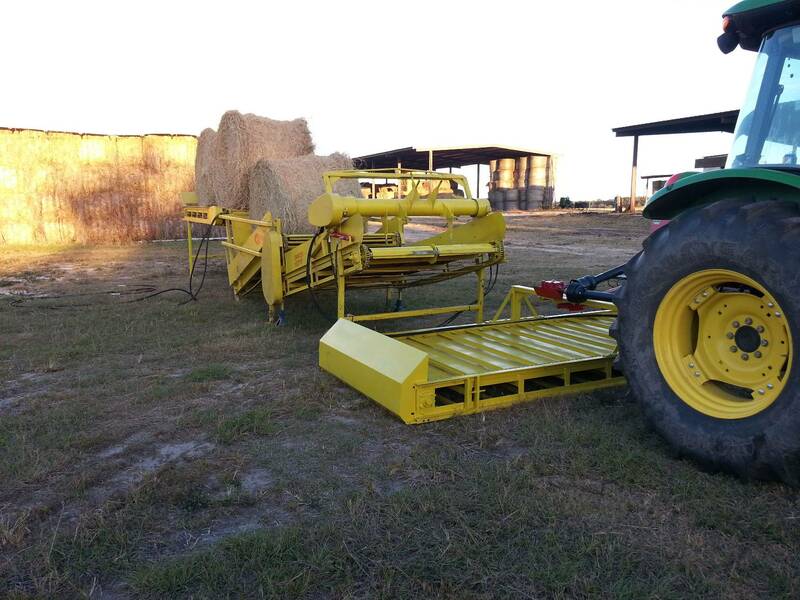 With 300 acres of bermudagrass and a wheat straw business, he doesn't have the time or the labor to make only square bales during harvesting. 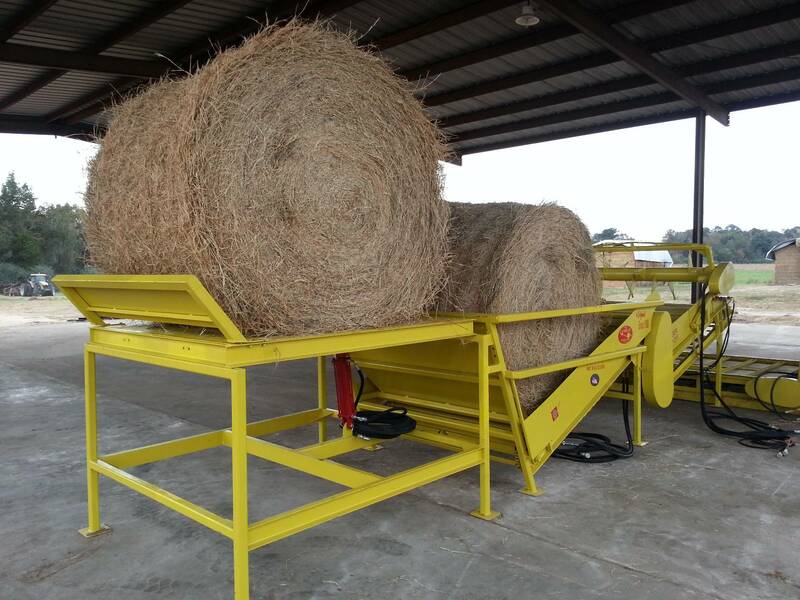 Simpson designed the hay unrolling system to be a three-person job that could be done any day of the year. "I fight labor just like other farmers," he says. "Labor is scarce, high, and sorry." He mainly relies on his son Henry. Selling Straw. 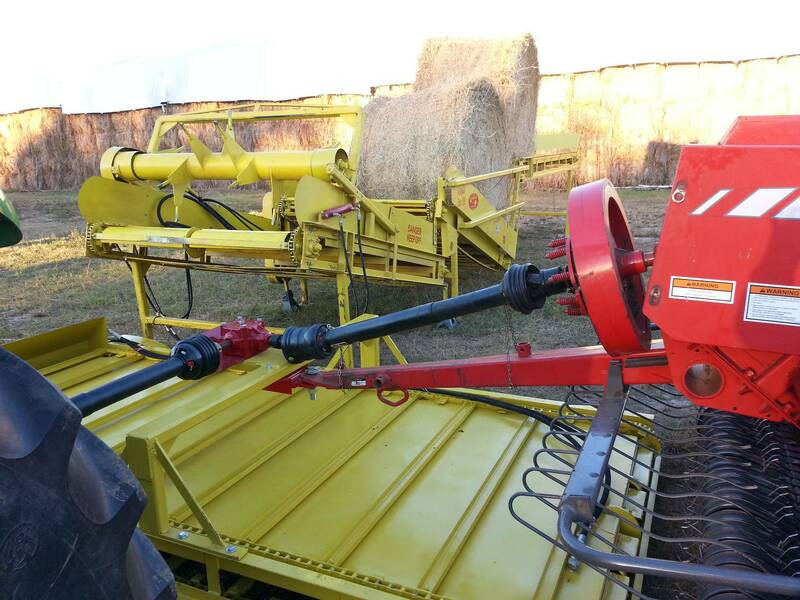 The unroller is especially handy for wheat straw. "We have a 3 ½ week period to put up straw," he says. 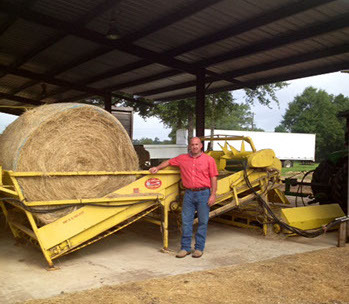 His goal is to unroll and rebale 10,000 rolls, including 3,000 to 4,000 rolls of Bermuda and 6,000 rolls of wheat straw. He sells his bermudagrass for about $150 per ton, plus shipping. 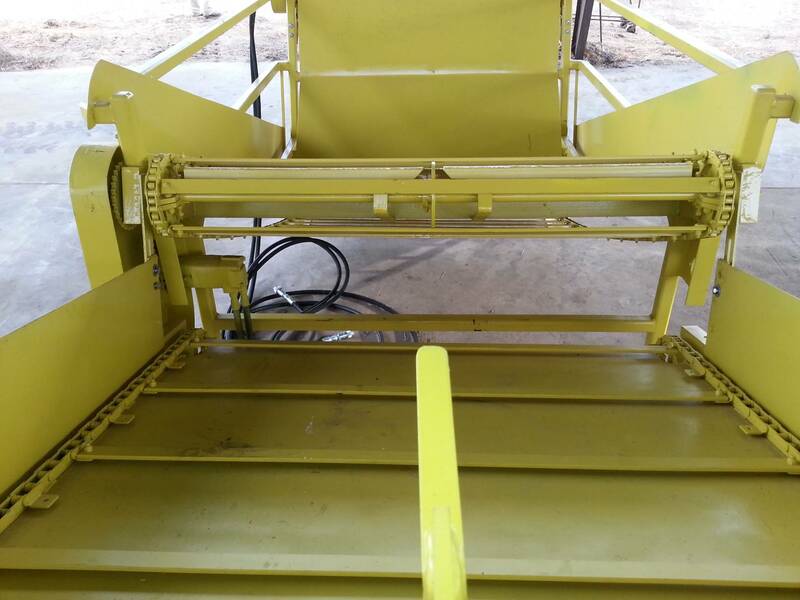 Simpson uses a 50-hp motor to run the square baler and to operate the hydraulic system for the conveyor belting. 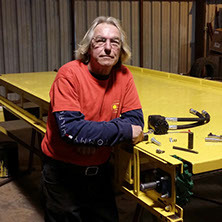 He operates the controls from a 5x7 foot platform with two seats, one for the operator and a second for anyone training to use the controls. In recent months, he enclosed the platform in a heated and air-conditioned booth. 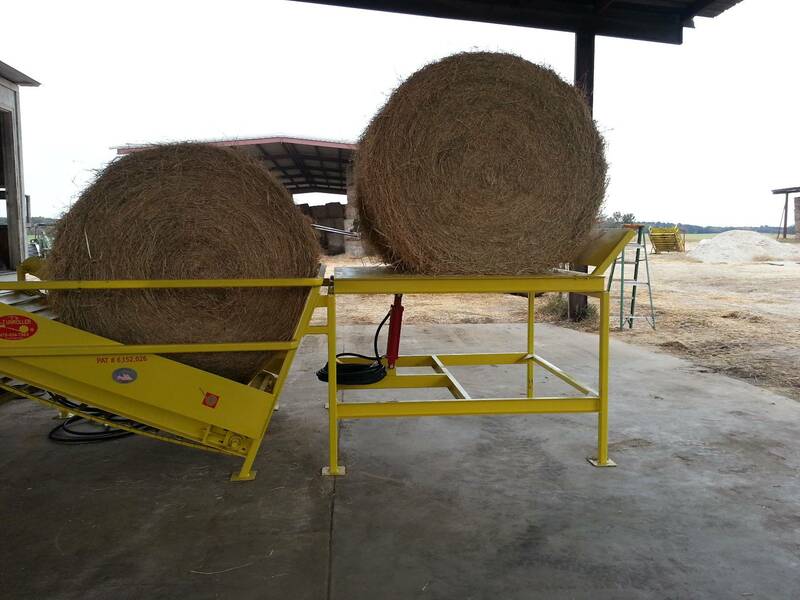 Under his barn, two of the unrolling machines are stationed at right angles to the square baler for good visibility from the elevated platform. 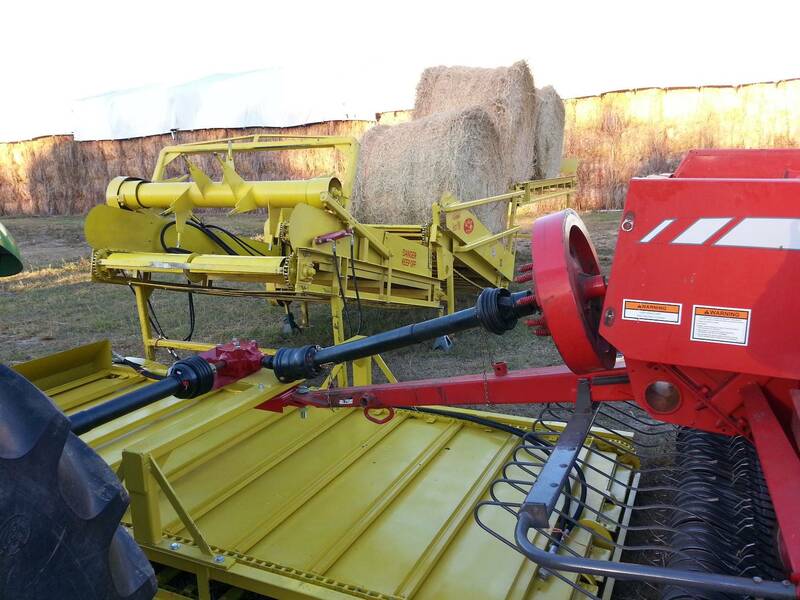 "Making the turn helps loosen the hay and separate it for rebaling," adds Simpson. 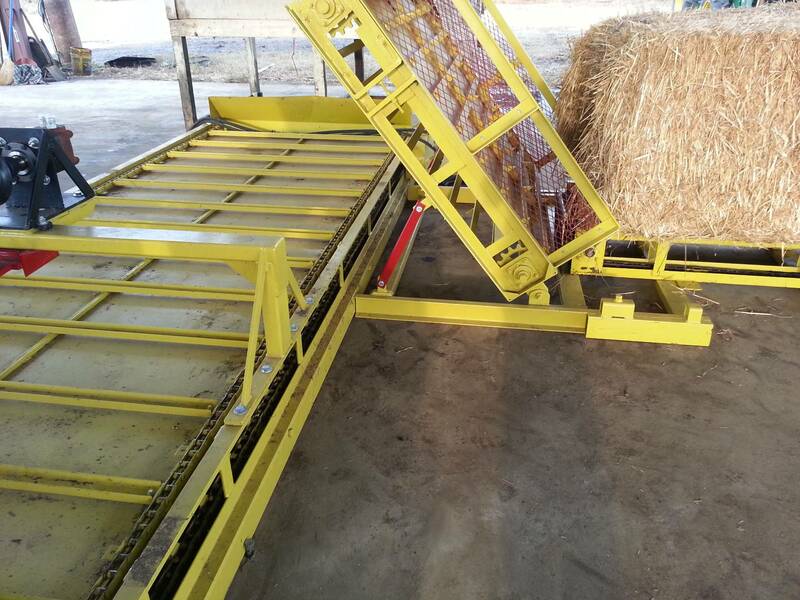 He designed the unroller to take advantage of gravity, to pull the hay down and loosen it. 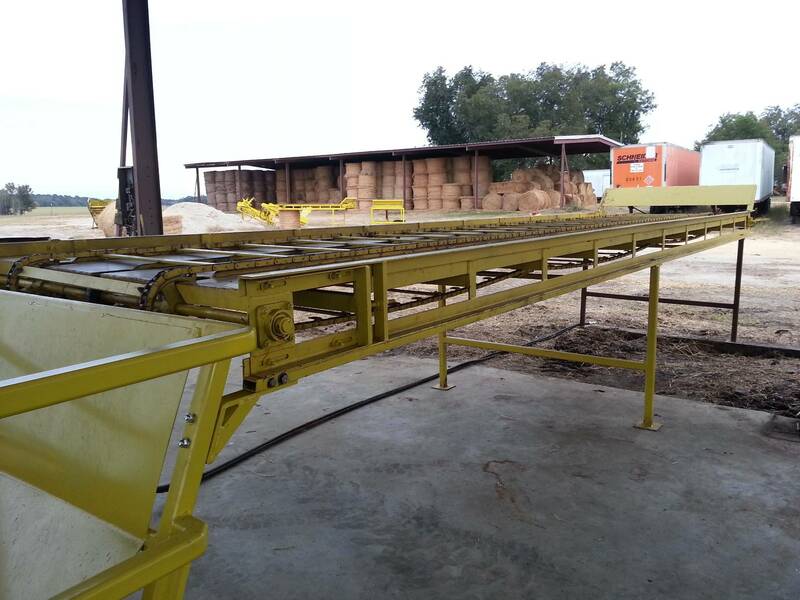 The hay is loosened as it drops from one conveyor to another and by a dethatcher cylinder on the second conveyor. Two-minute job. "It takes two minutes for a man to place a roll in the machine and pull off the clipped strings," says Simpson. "In six minutes, I can have the hay from that roll on the truck. 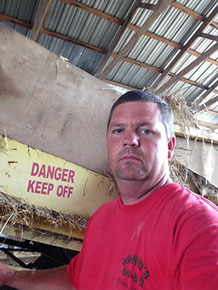 I save two minutes in bale dumping and string cutting by having two unrollers instead of one." 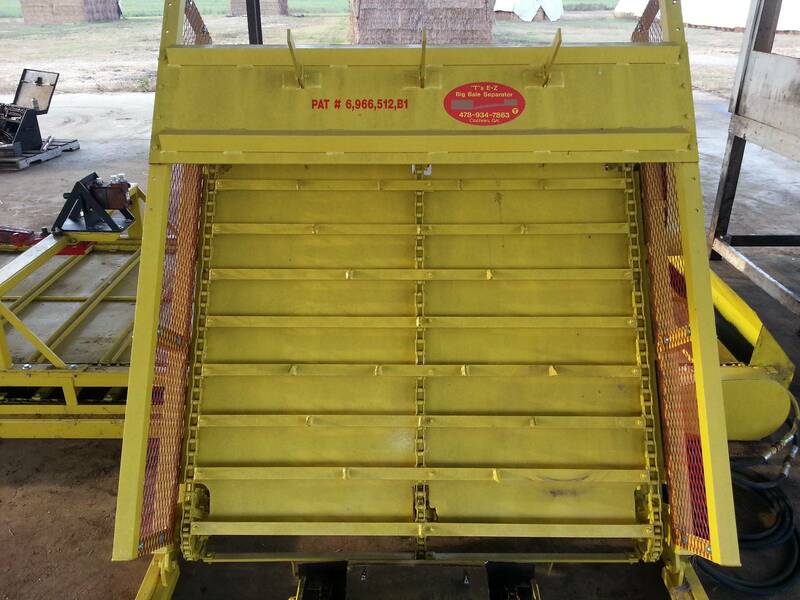 Simpson's square baler is a Deere model equipped with a short tongue to make the system more compact. 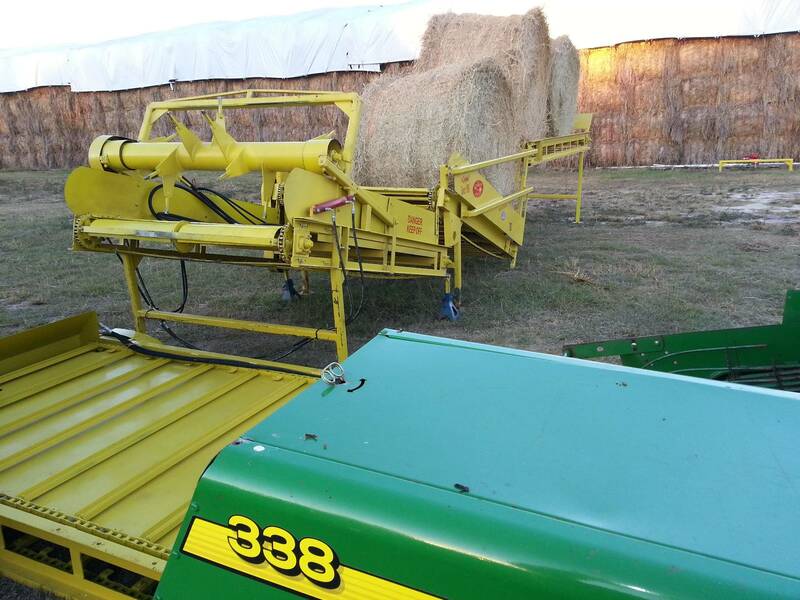 In unrolling and rebaling, Simpson says he doesn' change the character of the hay. "If it goes in long and stemmy, it comes out long and stemmy. 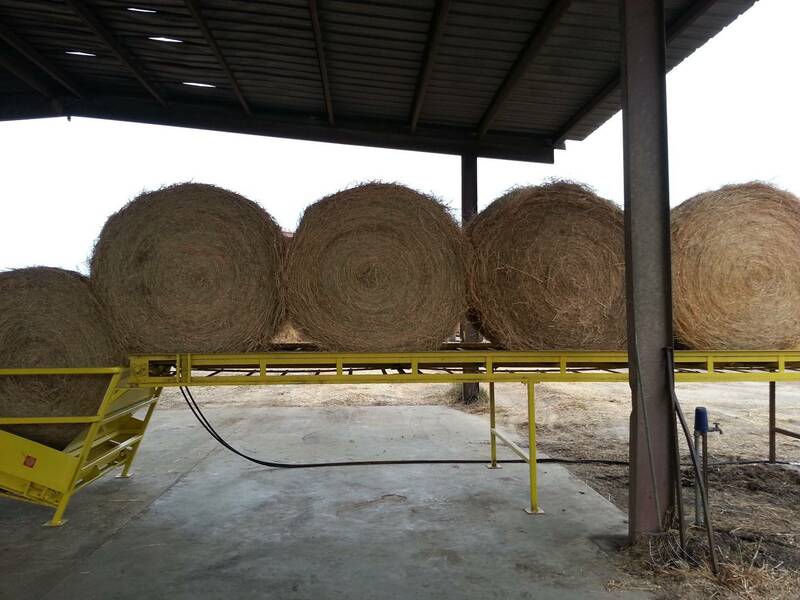 If you unroll hay, it will make you a better hay producer." He believes there is a market for his unrolling system among serious hay producers. So far, he has built the devices only for his own use. 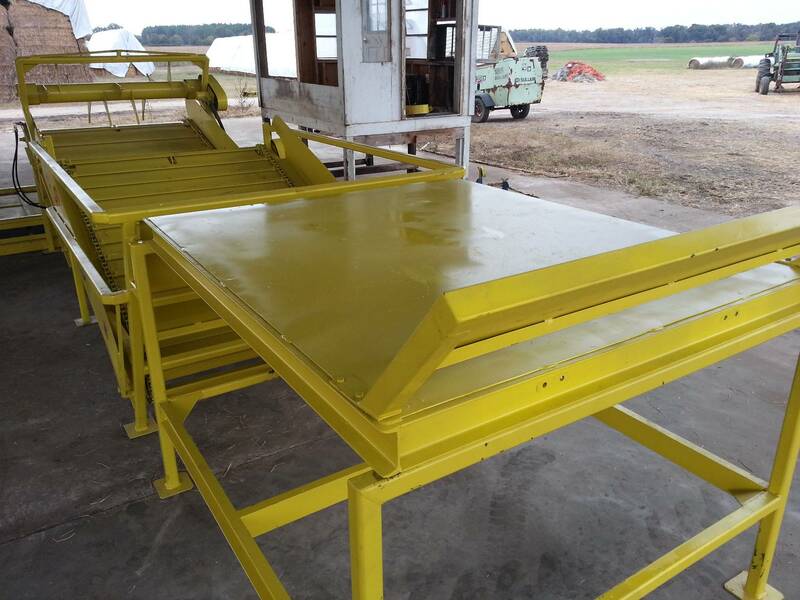 If he proceeds with manufacturing and commercial sales, he believes the machinery will sell for about *$13,000 for a single unrolling system and *$21,000 for a double system. 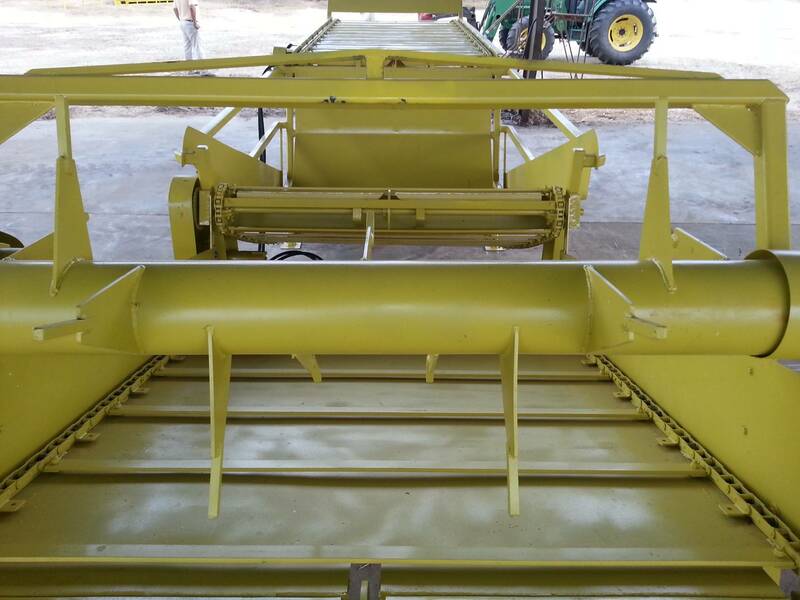 "We've done for hay and straw what the module builder did for cotton," says Simpson. "We've extended the baling season." *Article does not reflect current pricing. Systems start at $19,000. 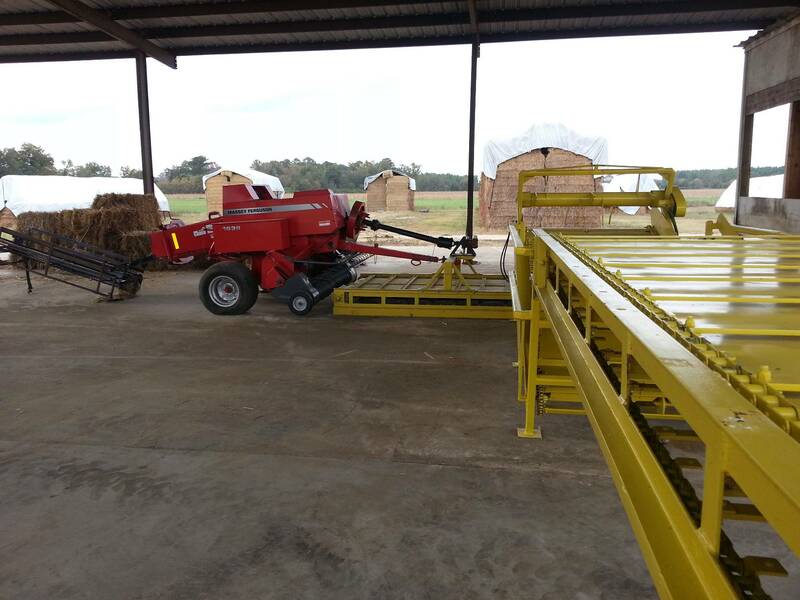 "Georgia Farmers Create Equipment to Increase Efficiency..."
MOULTRIE- Whipple Simpson and Jesse Grimsley embody the spririt of Sunbelt Expo. 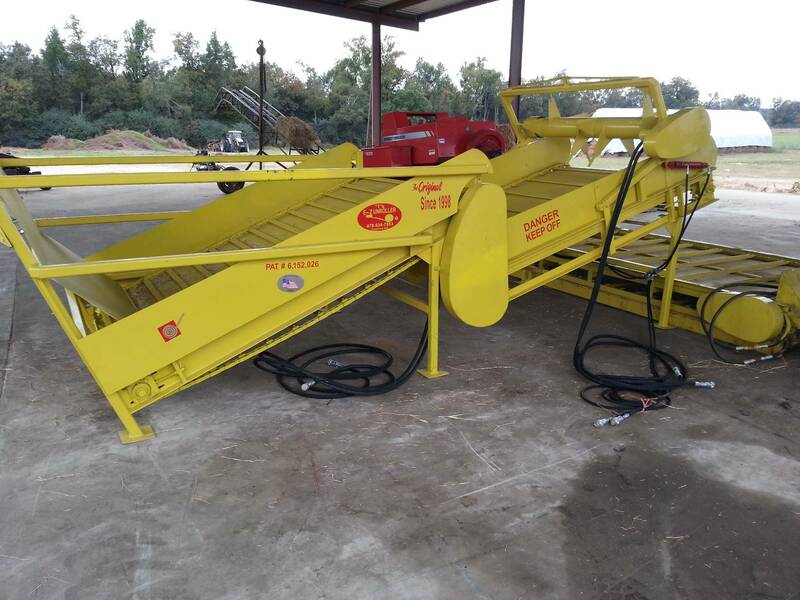 Both are Georgia farmers who invented farm equipment to the fields at Expo to show other farmers how their inventions could help them farm better. 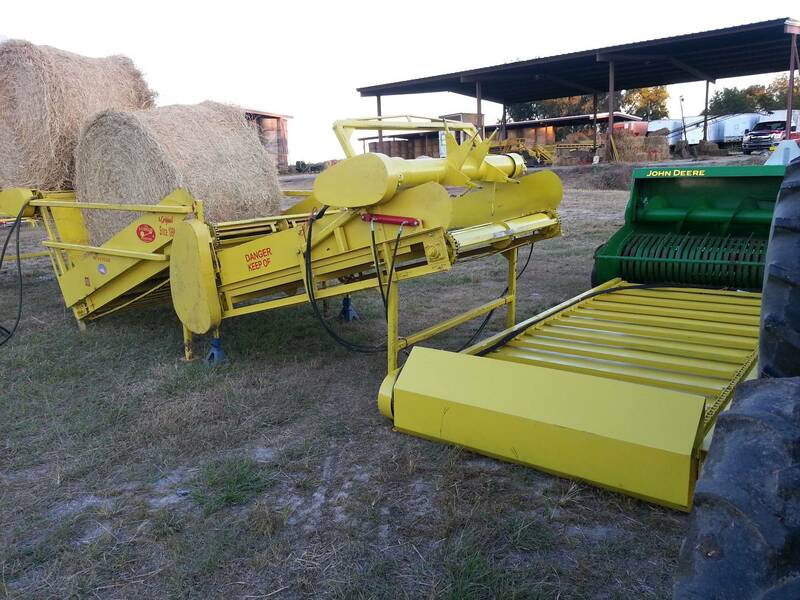 Simpson, a hay producer from Bleckley County, went to Sunbelt Expo in the early 1990s looking for a machine that could unroll round bales. He didn't find what he was looking for, so he went home and invented T's EZ Unroller. 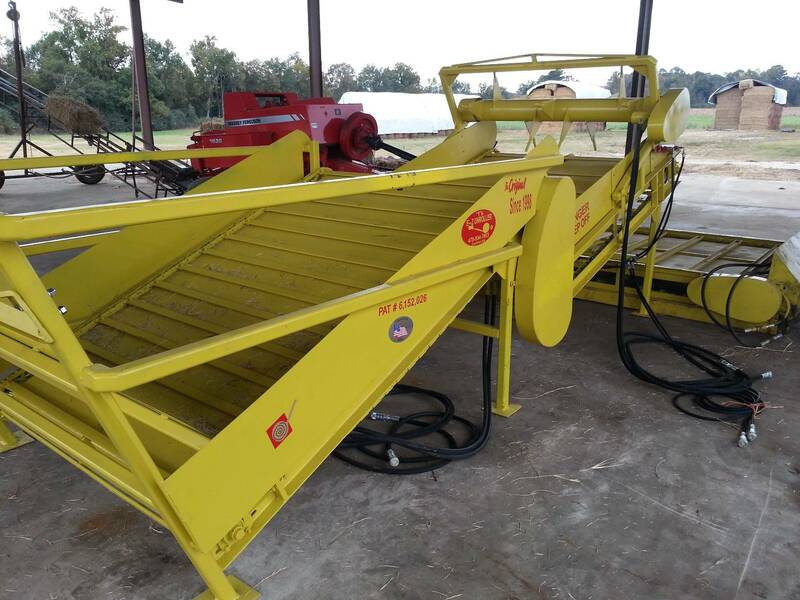 Simpson says his invention has the potential to revolutionize the hay industry the way the module maker has made the cotton industry more efficient. 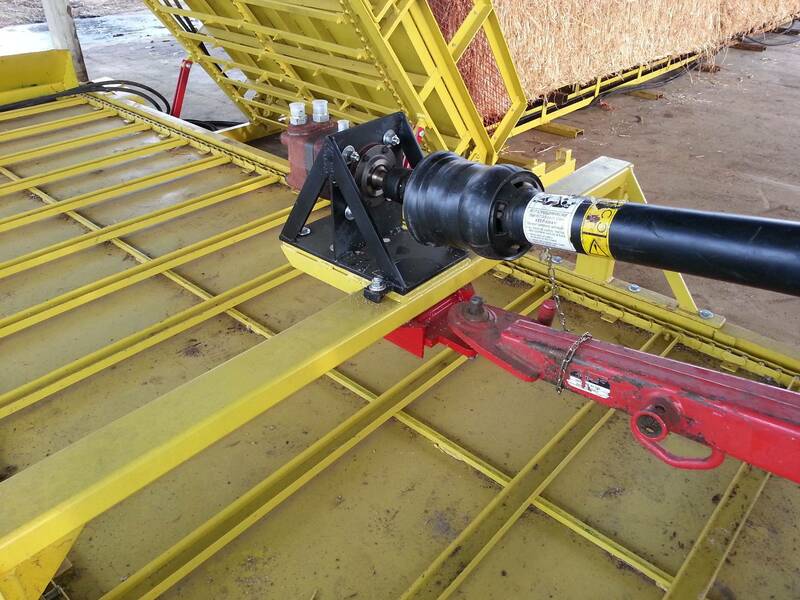 "The EZ Unroller extends your baling season, and it saves you a lot of time," Simpson explains. " It costs too much in labor and time to bale hat in squares bales." 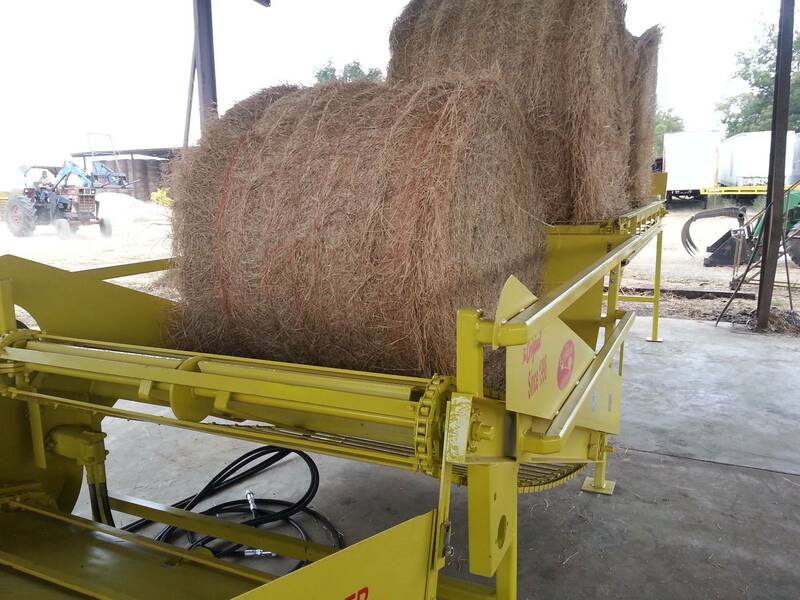 The unroller allows hay farmers to bale their hay in round bales at harvest time when time is of the essence, and then unroll and rebale them at a later date. 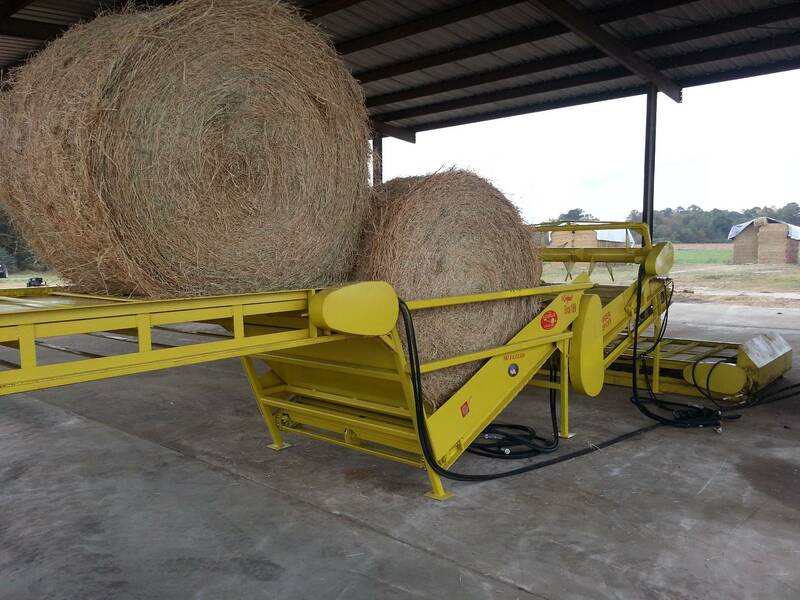 Simpson says the unroller can be used on any tyoe of hay, wheat straw of peanut hay. 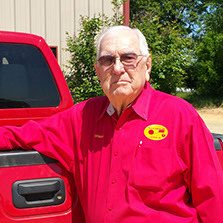 Simpson, who serves on the Georgia Farm Bureau Hay Advisory Committee, tinkered with unroller for seven years before selling his first in 1998. Since then, he has sold 17 to farmers in Texas, Ontario, South Carolina and Georgia. 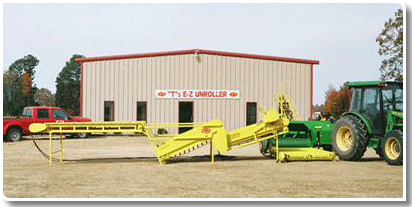 Simpson offers two versions of the unroller, a single unrollr at $15,500 and a double up roller a $43,000. 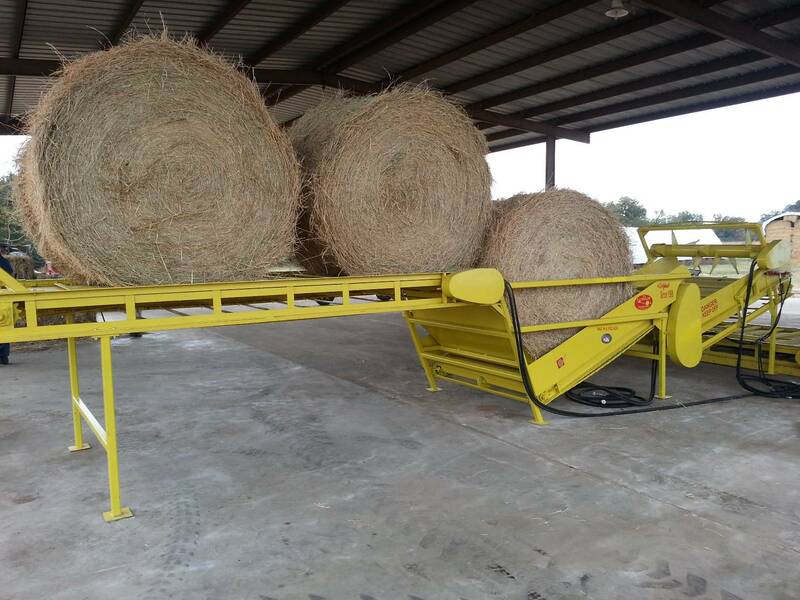 He says the single unroller is ideal for producers who bale up to 25,000 bales a year. 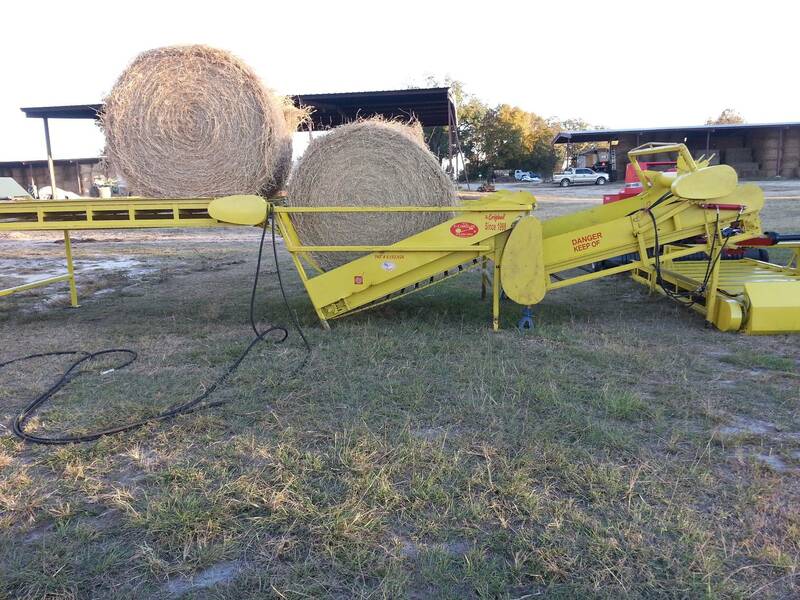 The double unroller is for the "serious hay man" who handles more than 200,000 bales a year. 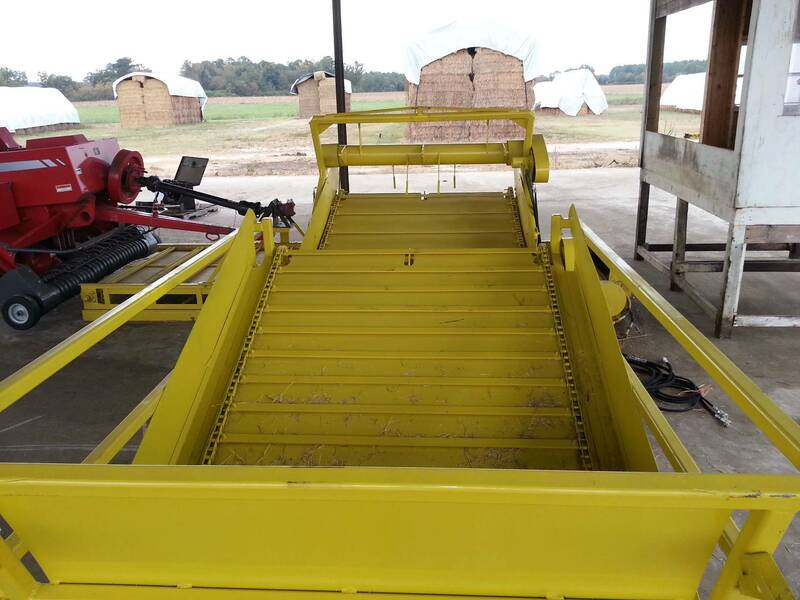 Simpson says the single unroller can be powered by any regular farm tractor. 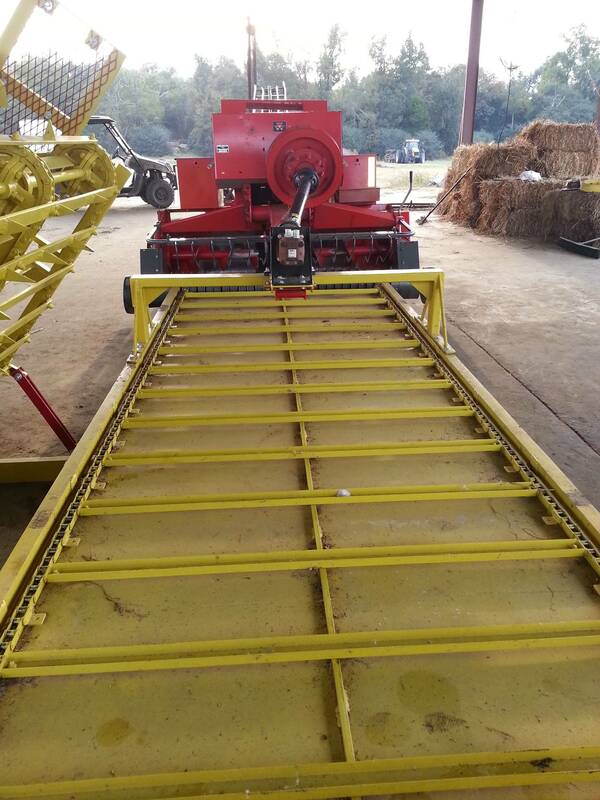 The double unroller runs on a 70 horsepower diesel engine. 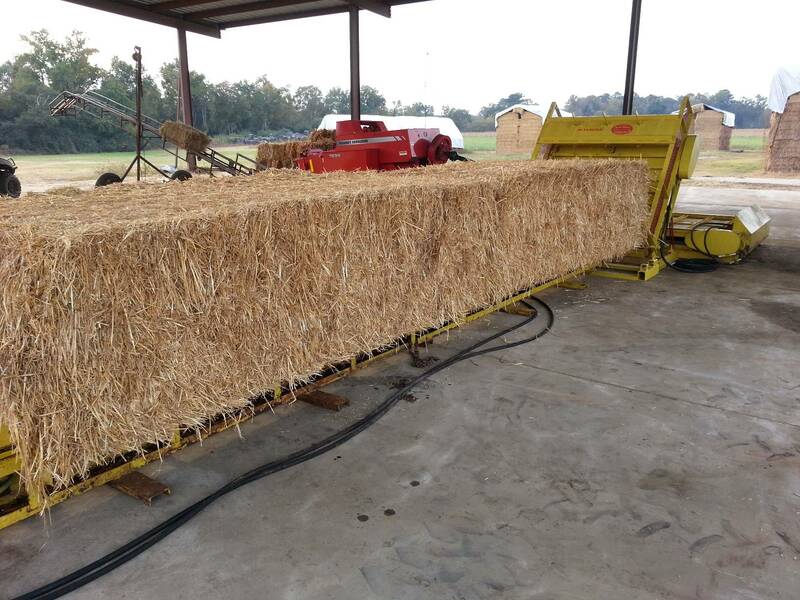 Last year, the Whipple Simpson family of Cochran, Georgia, unrolled 8,000 big bales of wheat straw and 2,000 of bermudagrass hay, and repackaged the material into 152,000 small rectangular bales. Wheat straw. 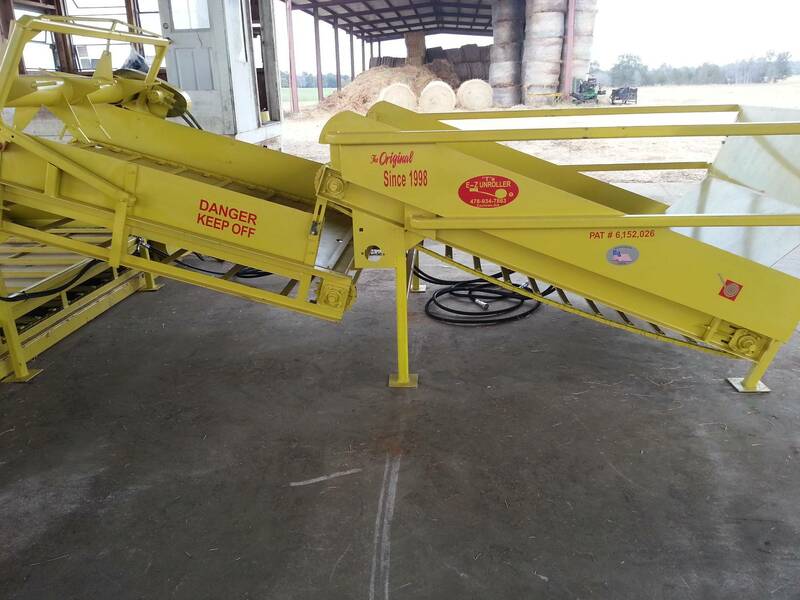 "Our original reason for designing and building equipment for rebaling was to allow us to gather more wheat straw in a limited amount of time," Simpson says. "Later, we started rebaling hay. 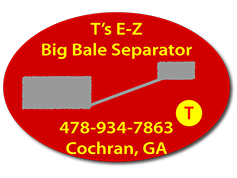 We're creating a size of bale preferred by our feminine horse-owning clientele by converting big, 650-pound round bales into 40-pound rectangular ones." Simpson says farmers in his area often follow what with a double crop of cotton or soybeans. To get maximum yields, they need to plant beans or cotton as soon as they're done harvesting wheat. Hurry. "When we have good weather, our wheat harvest only lasts about three weeks," he says. 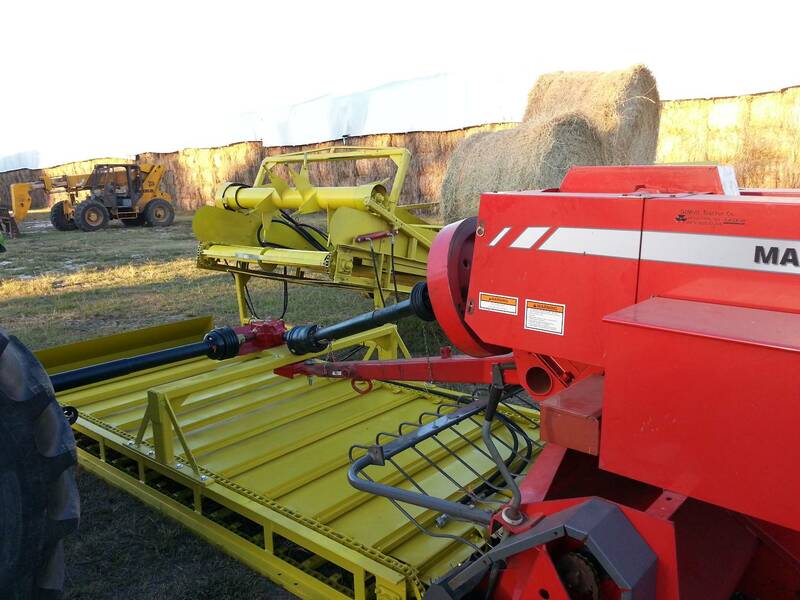 "We bale straw with two big round balers running right behind the combines. 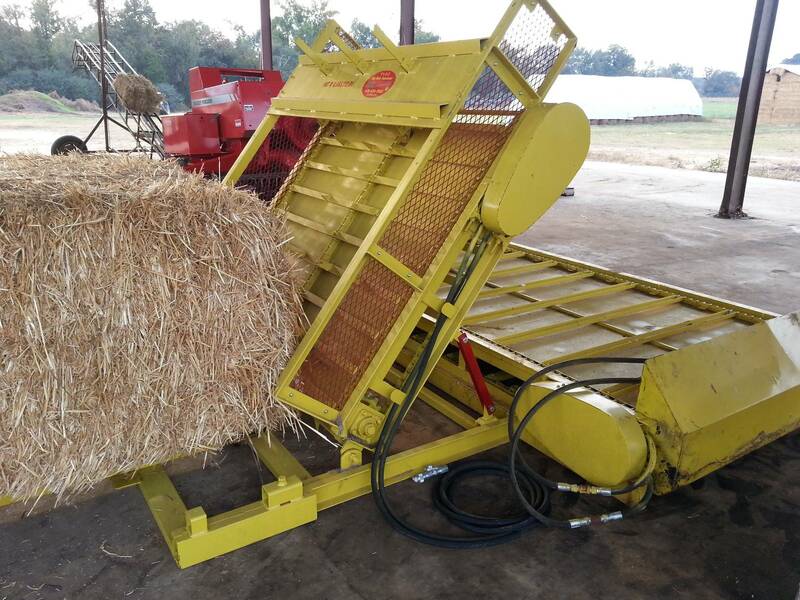 The round balers allow us to gather more straw than when we used machines that made small rectangular bales." Simpson and a son, Henry, spent seven years designing and building prototype machines that led to their current rebaling equipment. 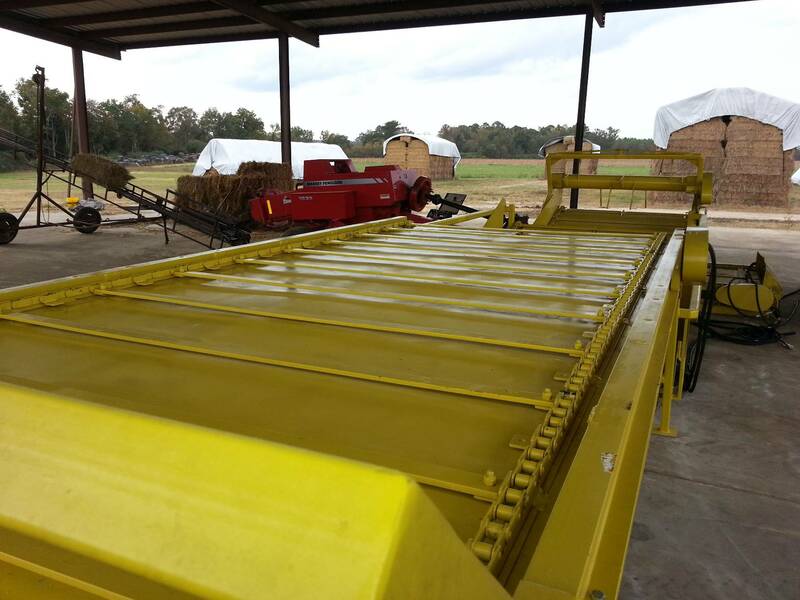 After unrolling big round bales, the machinery feeds the straw or hay into a conventional rectangular baler. 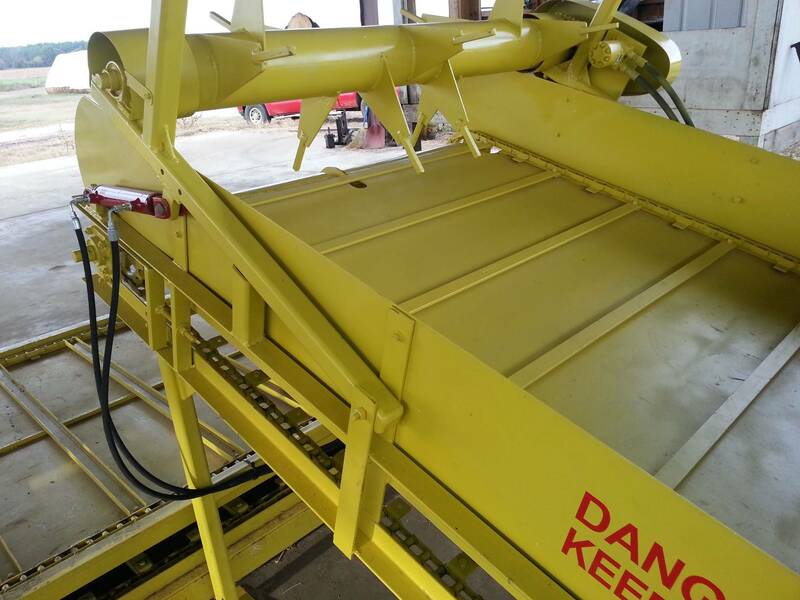 Other farmers have tried rebaling after putting material through a tub grinder, Henry says. 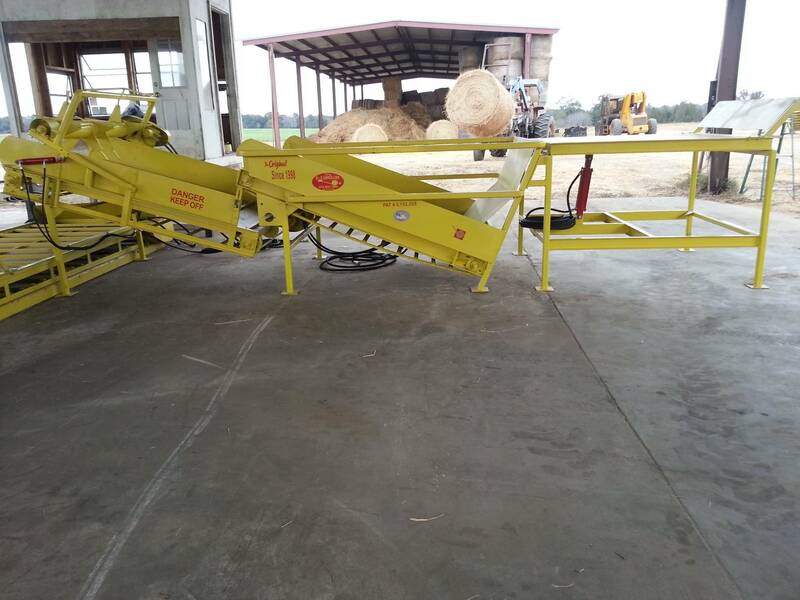 But the Simpsons' equipment doesn't cut or grind, and forage with loger fibers is generally more desirable feed for horses, cattle, and sheep. 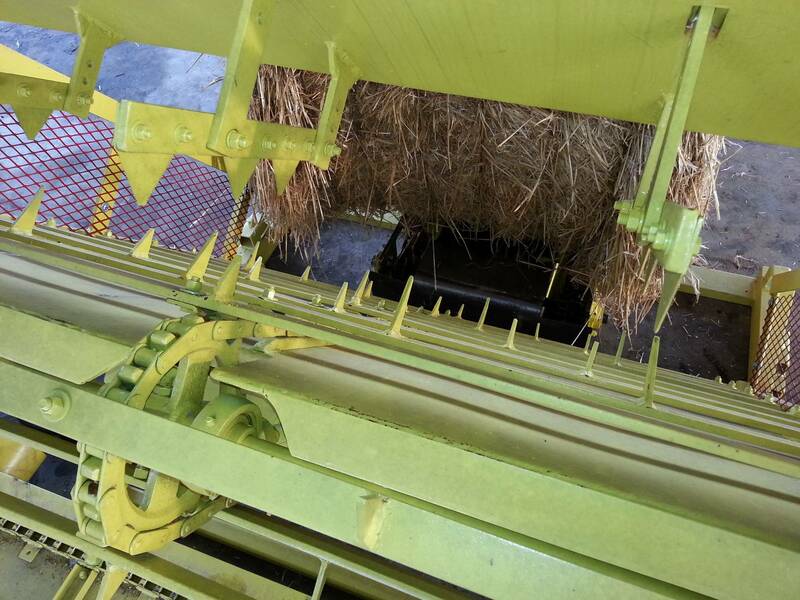 It takes the Simpsons at least two minutes to put each big bale in the hopper of an unroller and remove the strings. It then takes about six minutes for unrolling and rebaling. 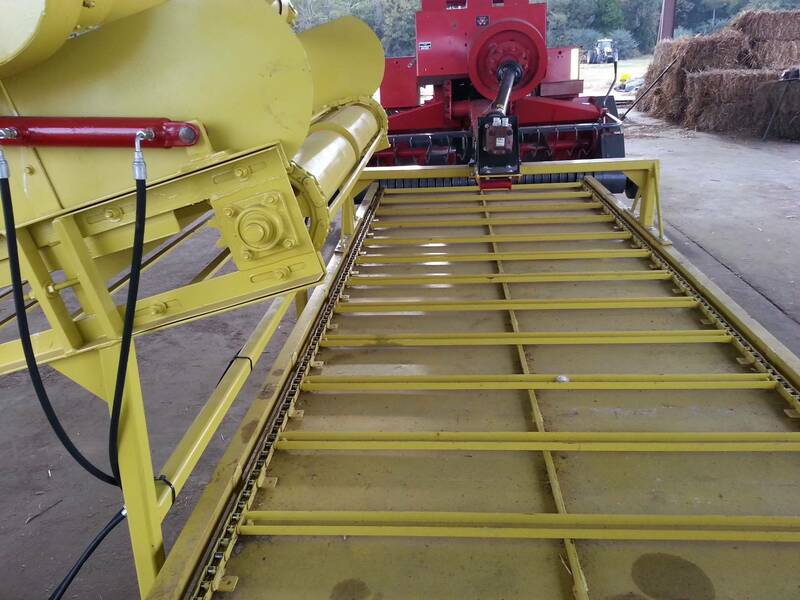 To keep the rebaling equipment running continuously, the Simpsons use two unrolling machines. 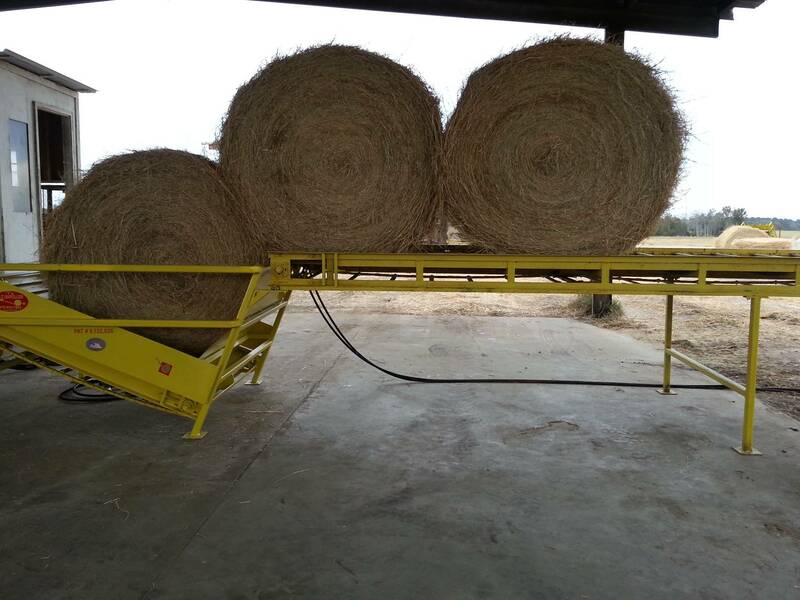 While unrolling one bale, they can load another into the other unroller. Recently, they repackaged 40 big bales into 600 small ones in four hours. A 50 horsepower diesel engine powers two hydraulic pumps that run the setup. 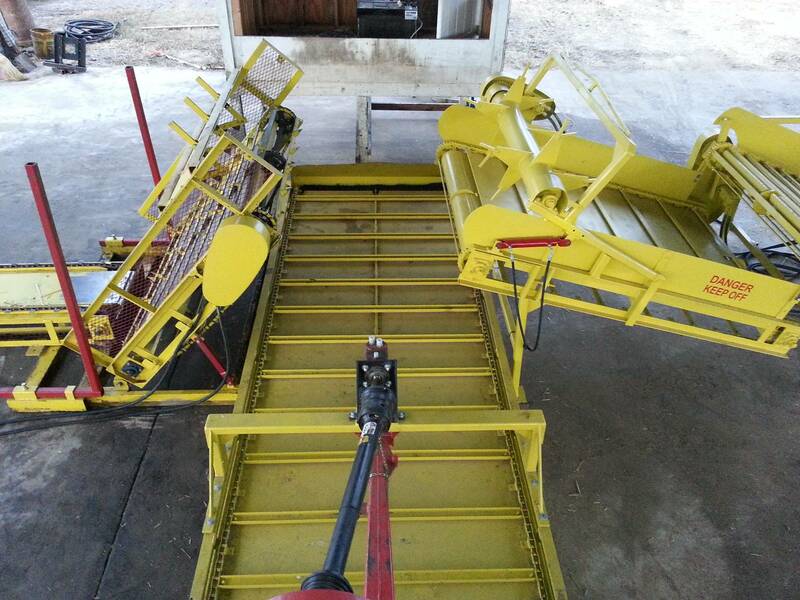 One pump turns the PTO on the baler; the other runs the unrollers and conveyor belts. Customers can request various sizes of rectangular bales from the Simpsons. 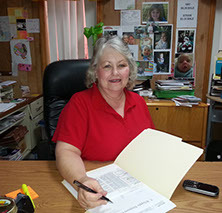 One woman, for example, wants 40-pound straw bales because she likes to put 40 pounds of straw in each horse stall. When she used 70 pound bales, she carried leftover straw from one stall to the next, which was inconvenient. Right size. 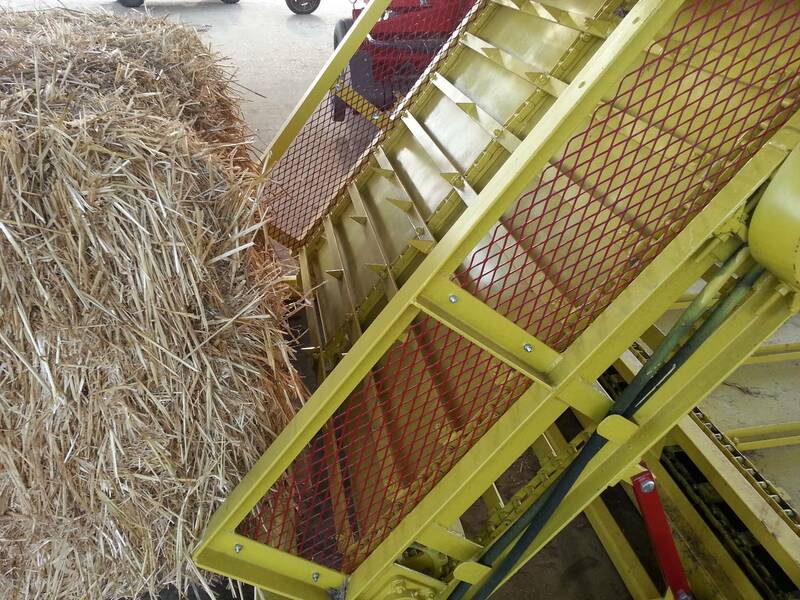 "The lady pays $2.50 for each 40-pound bale, which is the same she used to pay for a 70-pound bale," Simpson says. 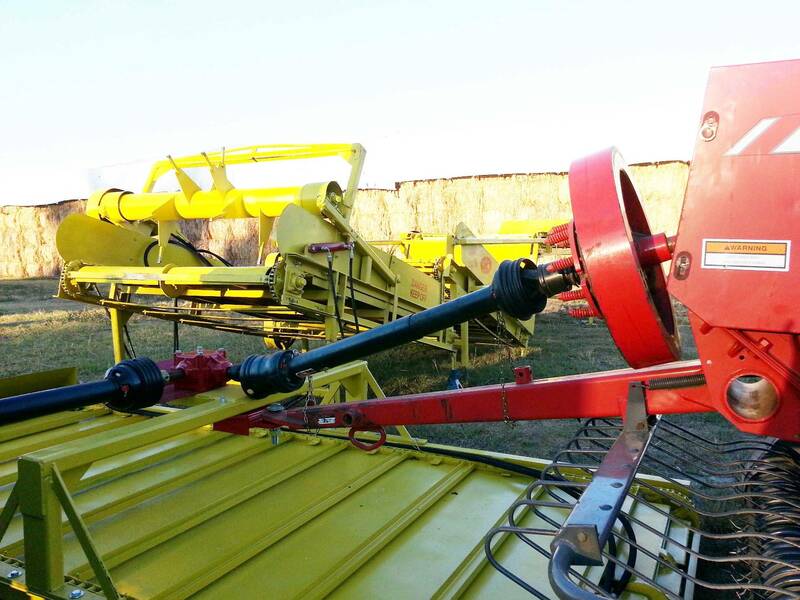 "Since we're rebaling anyway, it's easy for us to rebale in the exact size that will best suit each customer. The smallest bales we've sold weighed about 25 pounds." 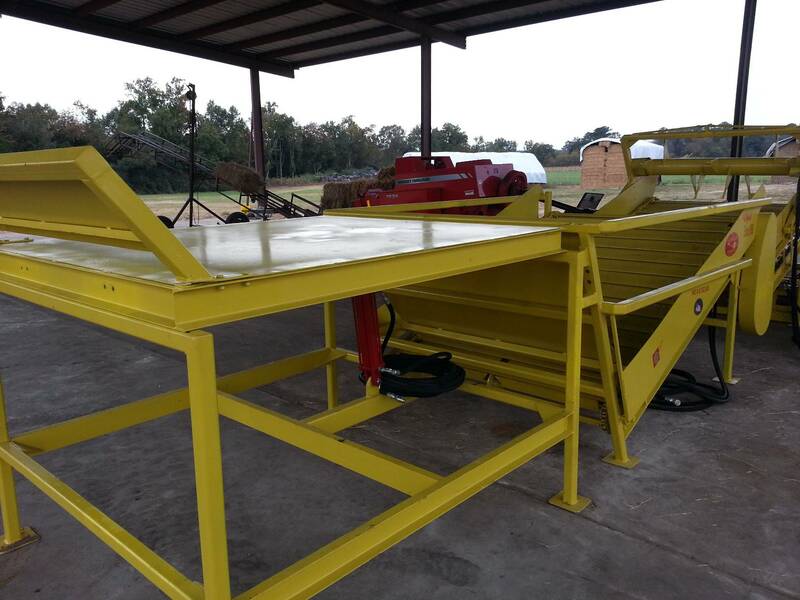 The Simpsons have contracted with a local machine shop to build rebaling setups, and they've already sold a few. 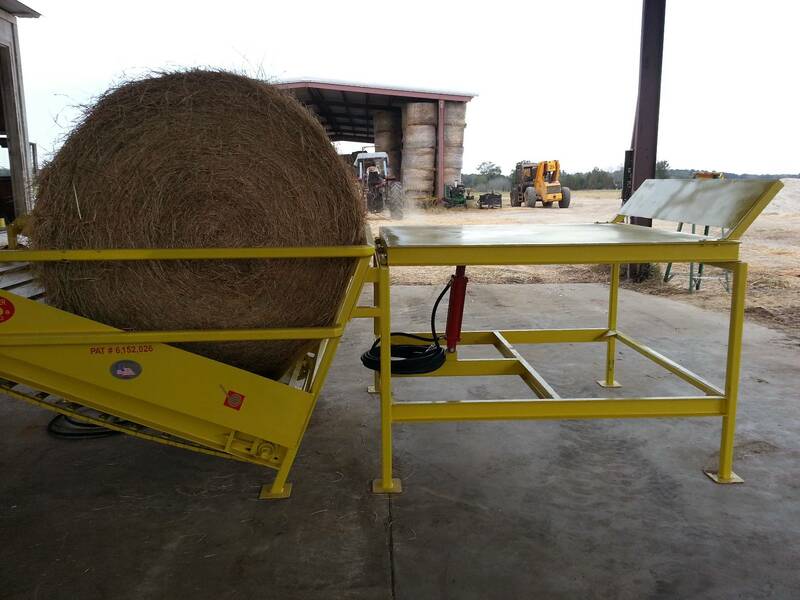 A setup with two unrollers and other options can cost up to $40,000. 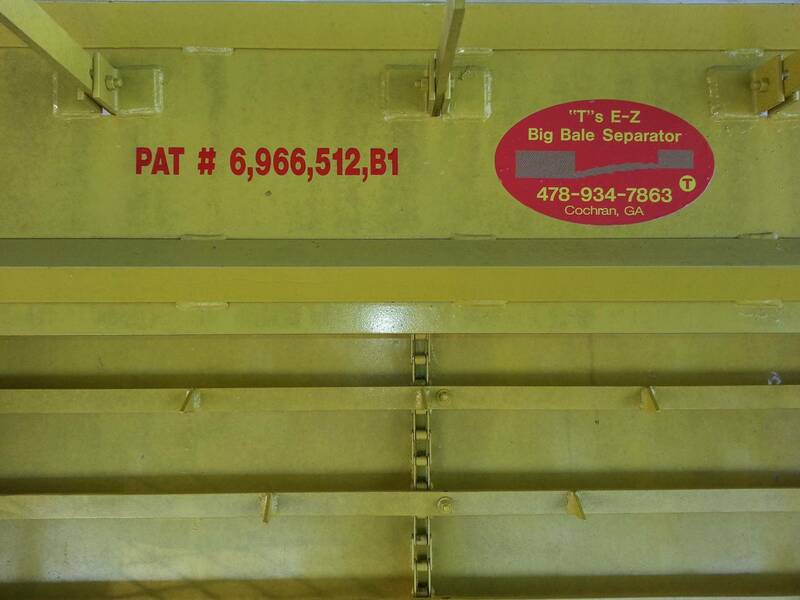 That price includes modifying a standard field baler for stationary work, but not the cost of buying the baler. Simpson notes that the stationary baler isn't entirely stationary. 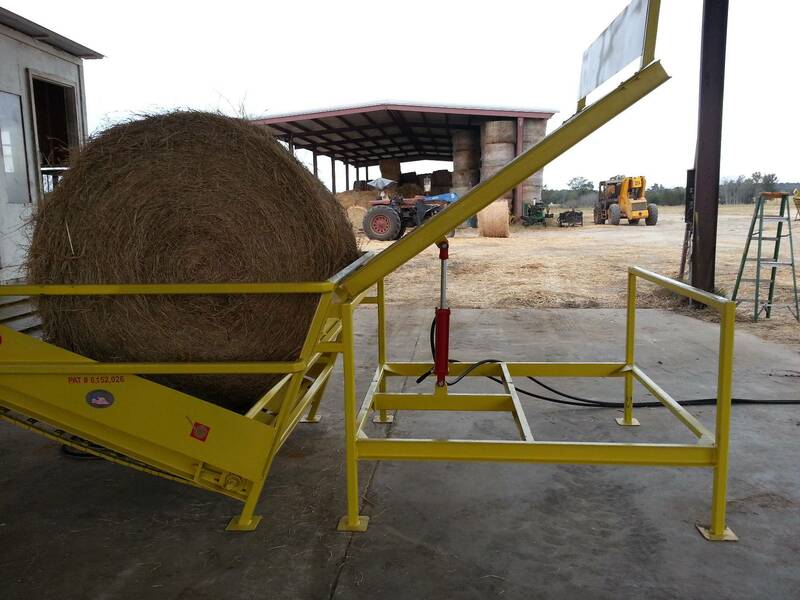 A shock absorber on the front hitch allows the baler to rock back and fourth a few inches with the momentum of the moving plunger. 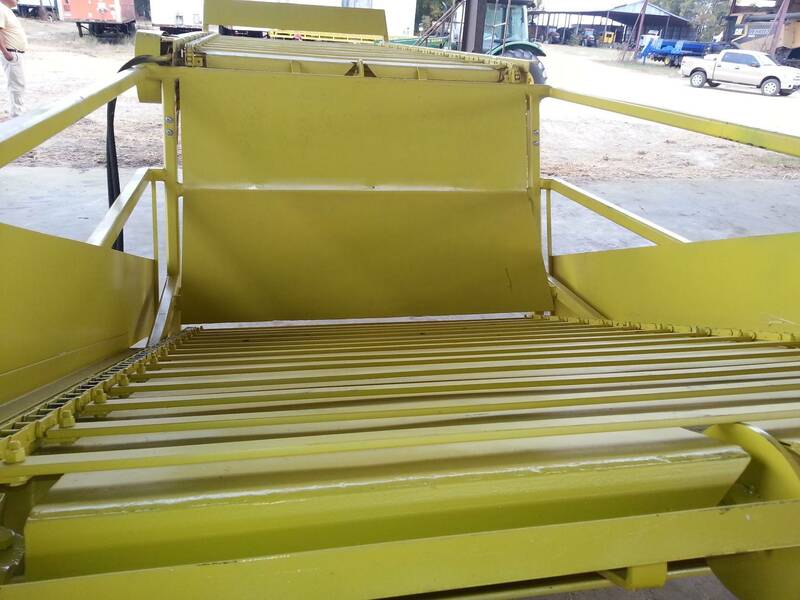 He explains that if the hitch had been solidly anchored to keep the baler from moving, the violent shaking would wear it out rapidly. 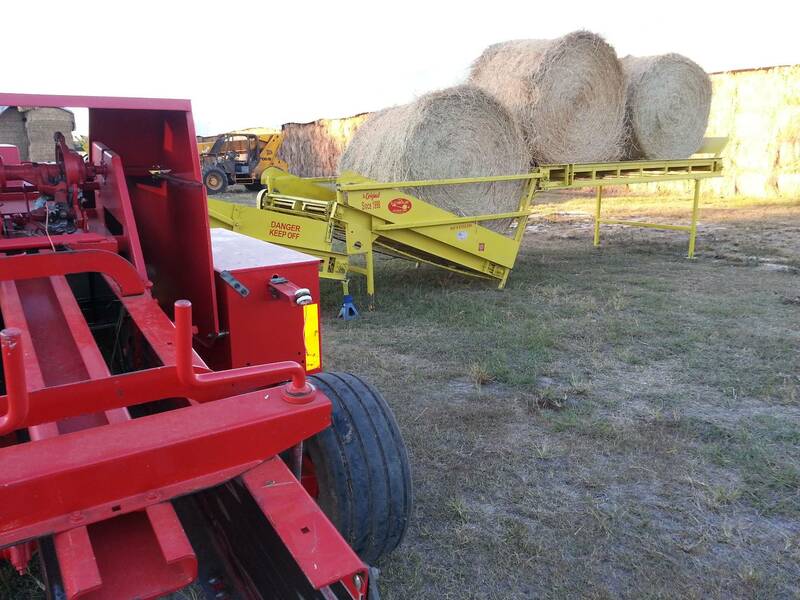 "Rebaling Offers Hay Marketing Advantages..."
University of Maine researchers have been investigating the economic advantages grass hay producers could gain by rebaling large round bales into small square bales. 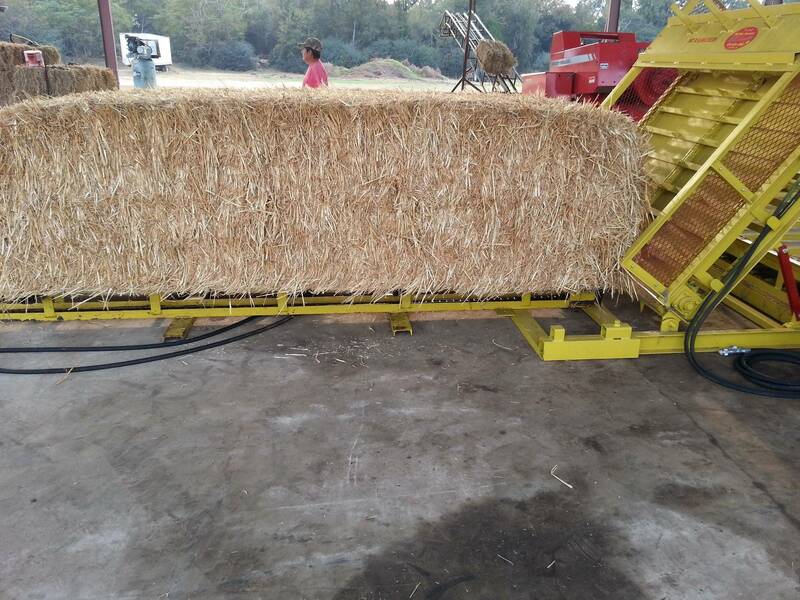 The technique allows growers to harvest and bale quickly by using large round bales, while cashing in on the demand for small bales from the equine and small livestock markets. A Simpco, Inc., bale unroller has been used for a number of months at the university's Franklin J. Witter Center, according to Donna Coffin Lamb, extension educator at Dover-Foxcroft, ME. 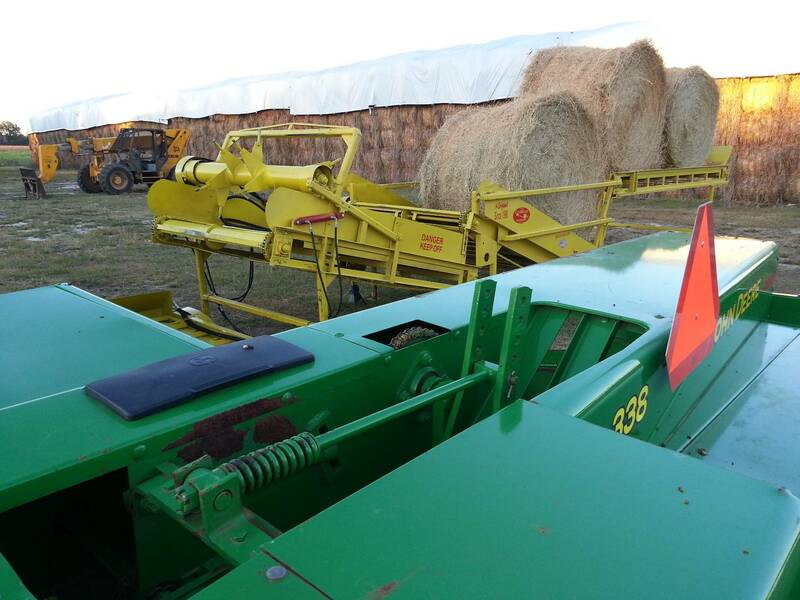 The machine unrolls round bales and feeds the hay into a square baler. 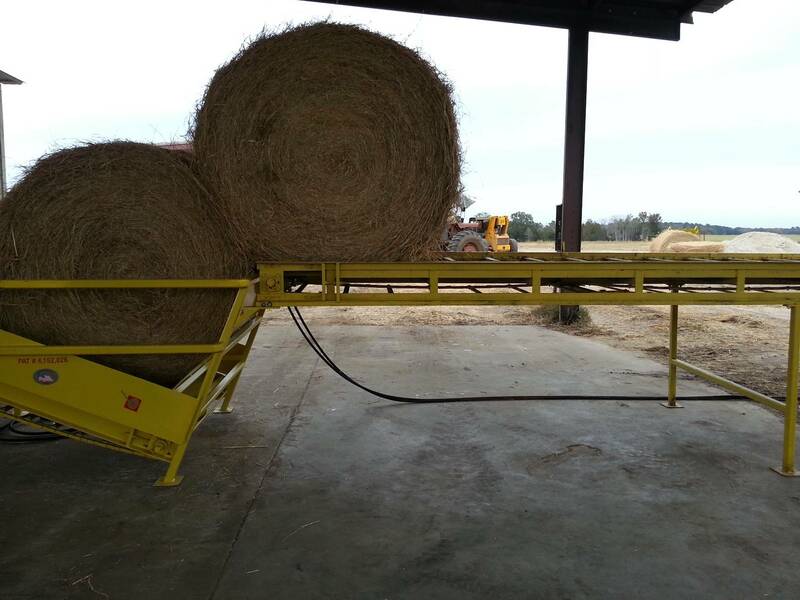 Lamb notes that preliminary experience has shown that 3.5 workers -- an operator, stacker, loader and floater/cleanup person -- can rebale about 6,000 lbs of hay per hour while increasing net revenue by $114.09/hour. 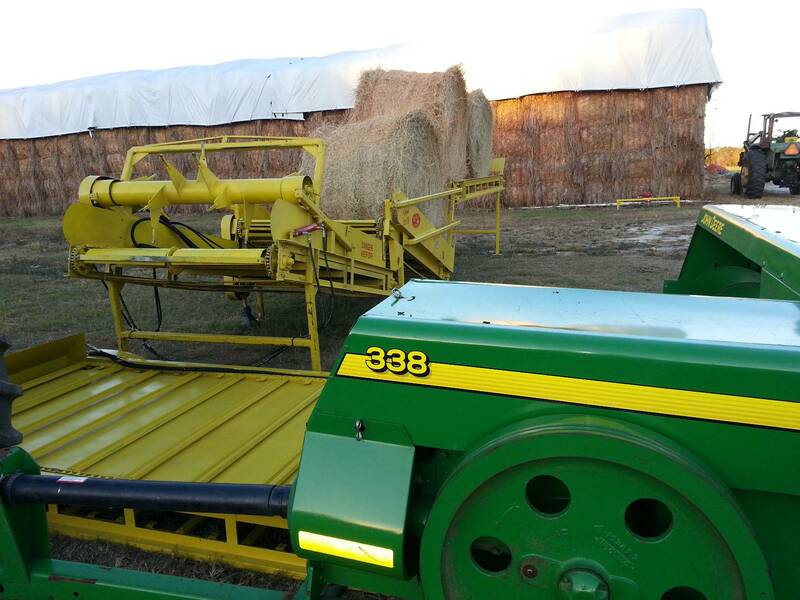 The designer of the unroller, T. Whipple Simpson, used his regular square baler to rebale the hay. He found that an 800-lb round bale valued at $37.50 would yield 19 small square bales weighing 40 lbs and valued at $3.25/bale. The University of Maine researchers, headed by economist James Leiby, used a similar process. He calculated a total cost of $357.16/hour to rebale 7.5 large round bales. That includes the $37.50 cost of each bale. The 7.5 round bales produced 145 square bales valued at $3.25 each, or a total of $471.25. 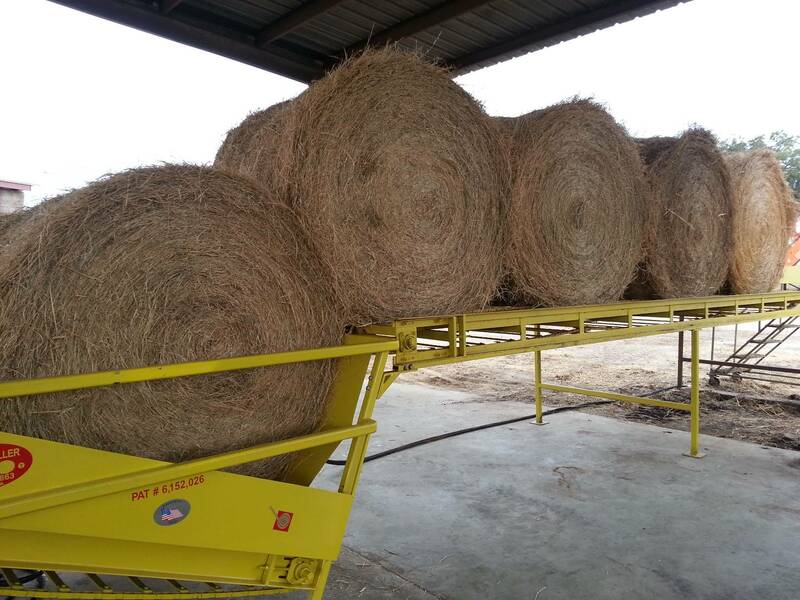 Net revenue increased $114.09/hour or $15.21/round bale. Labor costs were figured at $9/hour. Leiby points out that, in the worst-case scenario, with round bales costing $45 and wages at $13/hour, the breakeven price for square bales would be about $3/bale. 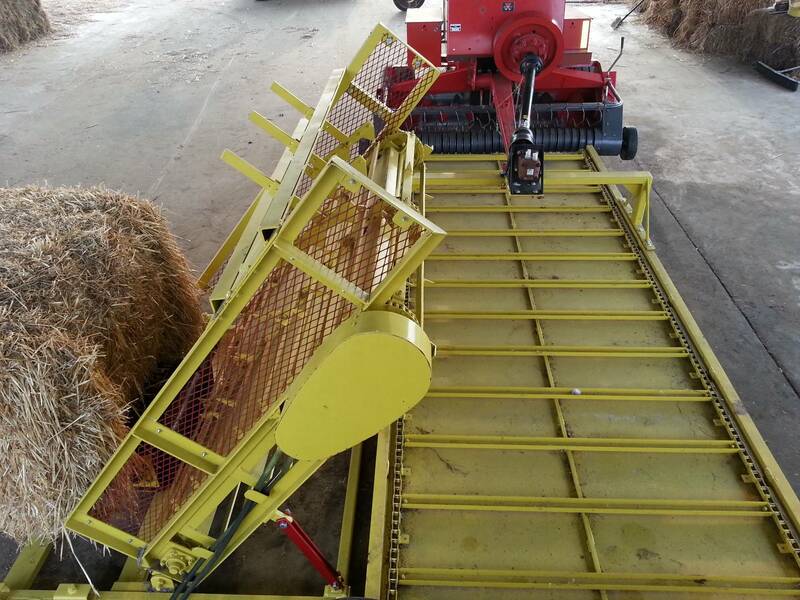 The rebaling costs alone were $75.91/hour, $10.12/round bale or 52 cents/square bale. 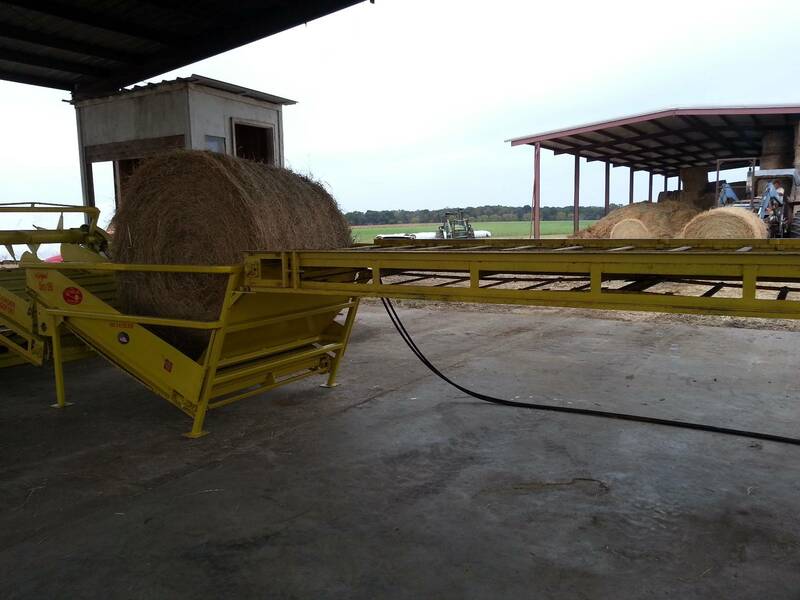 The researchers used two tractors, one for power and one to load, in addition to a square baler. 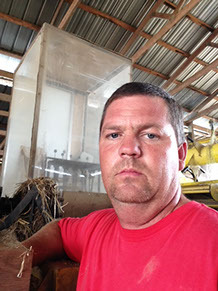 Lamb emphasizes that rebaling hay cannot improve its quality. "You need to start with dry hay that has been stored under cover," she says. 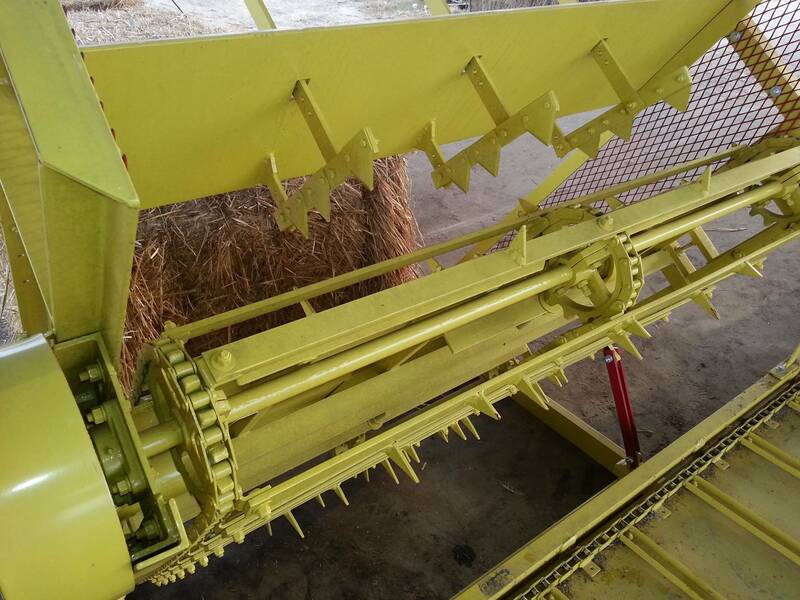 "Hay that has a large amount of spoilage on the outside or bottom of the bale usually binds up the equipment, so those looking for an option for rebaling spoiled hay into small square bales for mulch hay should not rely on this equipment." Leiby says Maine has about 38,000 horses. 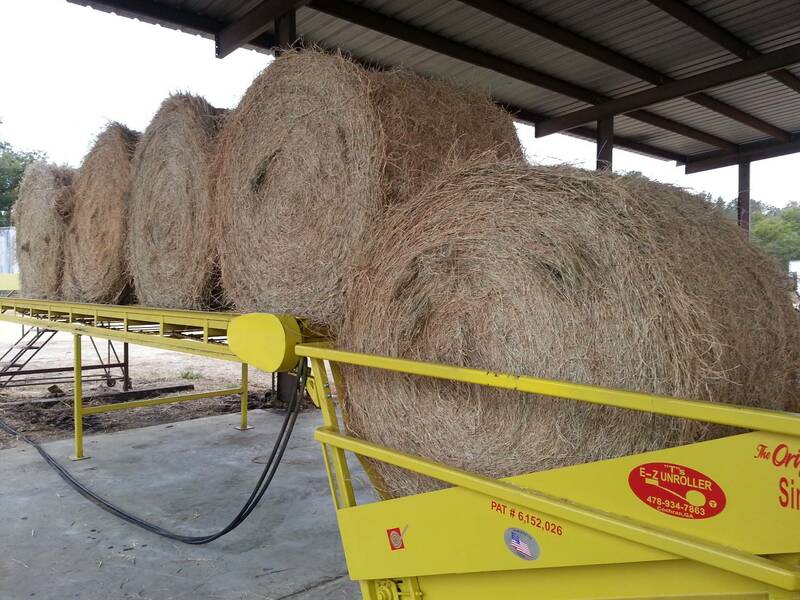 They need an estimated 7 million bales of hay per year, with a value of around $22.5 million. He cites an Iowa State University study that found baling hay into small square bales in the field can cost $14/acre more than producing round bales, plus small square bales cost more to handle. A University of Georgia study found the average price beef producers were willing to pay for hay in large round bales was $50-60/ton, which is very near the cost of production. However, the price went up to $150/ton when the same hay was put up in small square bales and marketed to horse owners. University of Maine researchers involved with the project include Lamb; Leiby; Justin Jamison, Witter Center farm superintendent; and Jake Dyer, Witter Center forage manager. Contact Lamb at 201-564-3301, Leiby at 207-581-3178, Jamison at 201-581-2793 or Dyer at 207-745-6181. 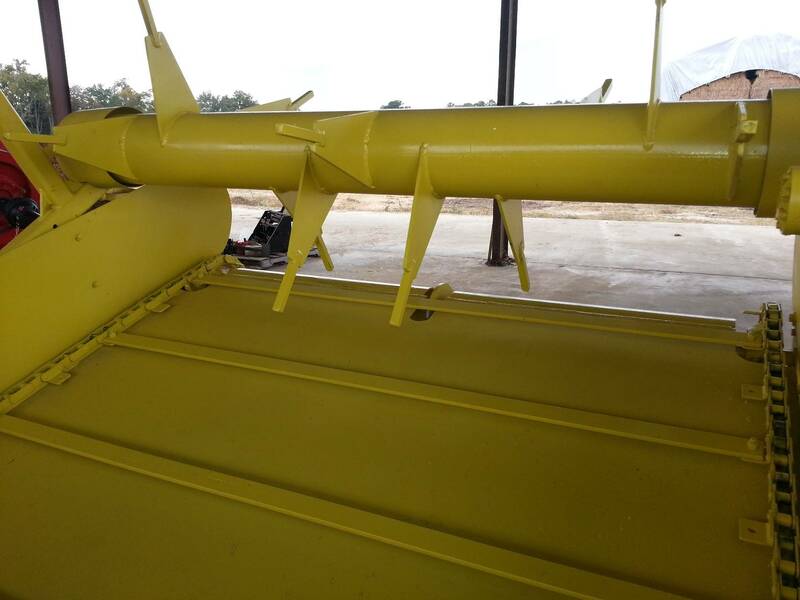 "How T's EZ Uroller has help Farms with flood in Gilliam....KSLA"